Even though swinging on a 3-0 count produces significantly higher batting averages and slugging percentages than waiting for 3-1 or 3-2, batters are going after fewer 3-0 pitches than at any time in the past 20 years.… Still, Forst said this was cyclical. Pitchers will eventually become more aggressive with their fastballs, prompting some hitters to start cranking it up again, and bringing the threat and excitement back to the 3-0 pitch. Any father wants to spare his son the mistakes, the pain, the suffering he went through, especially learning to trade. But every generation discovers there is only one way to learn: the hard way. As my son leaves his teens behind and starts his own trading, I offer him some hard won humble advice about trading. 1. Watch your money management. Don't over extend. Start small. Learn well at the smaller sums. Be brave with the smaller amounts. It’s not the dollars that are at issue obviously with X shares, it is ego/emotion, etc. 2. Assume it will take at least three to five years to get professional. No one goes into the market and starts making big money right away. No way. Everyone has to pay their dues. 3. Fear and hope work against you. They are ingrained by 10,000 generations. 4. You are at the mercy of the broker. 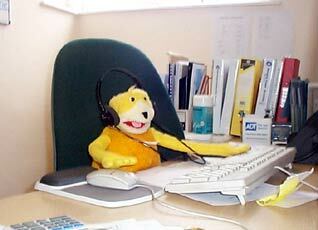 It is always a good practice to review your tickets each day like. The mistakes tend to be in their favor and not yours. 5. You will experience the real deal buying in on a real panic and experience the fear and uncertainty that will be a regular part of your trading life. Learn to embrace that feeling. It is not bad; it is good. It is what others feel and gives you the advantage to win. 6. You will learn the feeling of bailing too soon from the feeling of overexposure, and the great feeling of a winning trade and selling at the top. But it’s never satisfactory. Coulda, shoulda, woulda. Those there are in on every single trade. Ignore them. It’s not a precise science. For one used to winning, learning to lose is a big lesson. But by losing a bit less, and winning a bit more, the overall war is won bit by bit. That is the key. Avoiding a big loss. 15-20% a year turns into huge amounts over 50 years. 7. Don't grind. The fewer the pieces, the longer the hold, the lower the transaction cost, the lower the spread. It will eat you up over time. 8. Always haggle with the market. Put your orders in below to buy. Put orders to sell a bit above. Never give asking price. Never take the high bid. The extra cents add up over a lifetime. Better to pass a deal by than get taken by a fast-talking salesman like the market. See Practical Speculation on this subject. 9. Don't trade your profit and loss (P&L). You have to trade the market. The market doesn't care what your P&L is. It knows your break-even point and will come just short of it. 10. When things look the worst, that is the time to be optimistic and not fall into the herd mentality. That is the only way to make money. Look at it this way; it will never go to zero and you are not leveraged so you can never lose all of it. Even if it goes down 5 or 10%, it’s not the end of the world. You are 20 and have plenty of time to make money. Now is the time to take some risk and hopefully make some money. But if you keep your head and wits, it will turn out alright. 11. You can see how patience is important both for buying and waiting to sell. 12. The scariest points are the best times to buy. Everyone else is panicking. That's when you get some good deals. The herd is stampeding. That's when the predators pounce. 13. Sometimes walking away is best. If it goes down, you can buy more. Always good to have some cash. 14. It's very difficult, kind of like playing flinch with the hand slaps. 15. There are sharp operators out there that see you coming a mile away. When you look around at the poker table and don't know who the mark is, guess what? They know exactly what you are thinking. Welcome to the wonderful world of markets and trading. Murder on the Orient Express, with Albert Finney as Hercule Poiroit and a cast of all-stars, is truly an amazing delight. Albert Finney gave a spectacular job as Monsieur Poirot. If you like Agatha Christie it is required viewing. The cast comprises Michael York, Vanessa Redgrave, John Gielgud, Lauren Bacall, Martin Balsam, Ingrid Bergman, Jackie Bisset, Sean Connery, Tony Perkins. Fed economist examines "bounce" frequencies around support and resistance in FX. It is hard not to notice the similarity between the S&P this morning at 4 a.m. (New York time), and last Friday, when market went down 2% after a 1% down open. How it must have given hope to the chronic bears for a replay, and how like the market to give us terrorist news from London (an explosive device was found) to shake all the weak bulls out of their positions. This was all to try to offset the fantastic rise in bonds, to within striking distance of the round number (5%), which has been diffusing bearish arguments, forcing them to focus once again on the sub prime situation, which is getting a little gray in hair and long in tooth by now. All remaining bearish hopes, are that they will be able to club together, and belt the market down in the last few hours of trading, on the last day of month. How feeble all of this is, now that we can see clearly that the market is down a mere 1% for month, and the bears have played so many cards, over and over, without being able to bluff out any but the poorest players in the game. Laurel and I are currently in Santa Monica and were introducing our son Aubrey to the Pacific Ocean when our splashing was interrupted by screams from further down the beach. "Get out, get out" was resounding all around us now, and everyone was swimming for the shore. Two large gray fins and the flat bodies of two six foot plus sharks had apparently been sighted. We rushed ashore in panic mode, with no thoughts whatsoever except for getting out before the beasts ripped off our legs. However, the two big fins turned out to be dolphins, and pretty soon everybody was back in the water, thinking of what they should have done differently in such a situation. Laurel immediately commented, on how this event mirrored the markets over the last week or so, and I took out my copy of Animal Behavior by David McFarland, and vowed that I would study this field systematically to apply its lessons to market behavior. In a similarly fishy experience, we also paid a visit to the Santa Monica Aquarium, and studied an octopus as it tried to open a bottle with a crab in it. It used all of its 800 suckers to sample every aspect of the environment it was in, to avoid danger, and to assure itself that nothing else was in its domain. Carefully testing the waters with at least 100 probes, is something that all speculators should do also. Why do stocks respond to environmental stimuli in a particular way? Why do stocks respond to internal movements in their company and financials in a particular way? Why do some stocks respond in one way and others in another way, to the same situation? Why do stocks of a particular industry or style, or value category, characteristically behave in particular way in a particular situation? I believe the framework that McFarland and Tinbergen adapt in their works in this field would be a good one to follow in our own work on the markets, and I intend to do so in subsequent posts on comparisons between animal and market behavior, and what we can learn about the latter from the former. What's more surprising, that the US deficit/GDP ratio is the best of this lot, or that Italy looks good next to Japan? If I recall properly, Japans sovereign debt to GDP is larger than any country has ever been able sustain without a collapse of their currency. The highest debt to GDP that a country has been able to work out of was the US post WW2 at about 140%. It's interesting that every year or so, as we discuss here, the yen repatriation and associated carry trade unwinding is supposed to kill the dollar. Buffet / Rogers et al jump on board and the media frenzy lasts about a week or so. None of them ever mention the dire situation Japan is in, which is compounded by their aging demographic and lack of an appropriate immigration policy to change it. And I think their personal savings rate has fallen to 8%, the lowest in Asia. Western Europe is in a similar-situation although their savings rates are still roughly-14%. How does the dollar collapse in that environment? Where would the capital go? Why would the capital go? What benefit may be achieved by either area taking their savings home from the US? The War of the Spanish Succession - the first European World War - left Britain, France, Austria, Spain, Netherlands, Sweden, and Russia with debts that, compared to their governments' actual cash incomes, were far greater than those owed by Japan, the United States or any of the countries of Europe. At the height of the crisis, in 1719, the costs of debt service alone for the British crown were 60% of the government's income. Yet, somehow, the Brits, alone among all the other European nations, successfully refinanced their debt and began their journey towards Empire. You can read an introduction to the story of their financial triumph, which paid for Marlborough, Nelson, and Wellington's victories. Inflation was very high after WW2 ended, correct? So the real value of America's debt would have been significantly reduced. Considering that inflation was a widespread phenomenon among recovering economies, America's currency did not suffer a relative collapse, but Americans holding government debt were screwed. In this case, Japan's currency seems destined for a relative collapse. I believe that debt service costs the Japanese government about one-third of its income. US Inflation fell precipitously immediately after the war. There was another spike in the late 50s, but there were also two periods of deflation in the immediate decade (or so) into the post-war period. For the most part, inflation was rather benign, by today's standards, until the late 1960s. Hmm, I simply can't reconcile US debt/GDP falling from about 135% at the end of WWII to, what, 20% by 1960? How could economic growth have been that high? Yeah, taxes were high (top marginal rate was about 91% and top effective rate approx. 57%) and Eisenhower was extremely frugal, but Korea would have ratcheted up the national debt again. So I have a hard time getting those figures to add up without brief but intense bursts of inflation at some point in the 1945-60 time frame. I think Charles takes the point. There was also a brief spurt of energy price inflation with the start of the Korean War, but that was entirely the product of the Truman Administration's imposition of Jimmy Carter controls. When those were repealed (with the Republican's taking control of Congress), the gas lines disappeared and Exxon was offering to put a tiger in your tank and give you free dishware with every fill-up. The consensus forecast of most expert opinion in 1945 was that the country would experience a deflationary collapse. Sewell Avery, the Chairman of Montgomery Ward, decided to hold cash. The radicals at Sears (!) chose to expand. If Mr. Avery and others holding bonds were "screwed", as Alex puts it, it was not by any precipitous decline in the value of the dollar but by having failed to participate in what John Brooks described as Seven Fat Years. As for the bankruptcy of the Glorious Revolution, that was entirely a function of the unwillingness of Parliament to pay the King's bills, not any crushing burden of debt. The Duke of Marlborough (hero of the War of Spanish Succession) started his career as a young go-fer to the Stuart crown; he - and most of the other smart money - changed sides when the Dutch indicated a willingness to make a white knight takeover bid. "Bankruptcy" was the cover story; the real issue was the unwillingness of the city merchants to accept even a hint of the restoration of full civil rights to the Catholics. And so, for another hundred plus years, no one who wanted to hear the mass in Latin could attend Oxford or Cambridge. That did not, of course, prevent Marlborough's forces from being the allies of the Austrians (still among Europe's most fervent Catholics) against the comparatively agnostic French. I have generally found that, except for a few people with the fastest computers and best algorithms, anybody who can't be away from the market for a few hours likely adds no value whatsoever. The best investors I have known all find inefficiencies that persist, such that there are large windows for taking advantage of them. In fact, the reason why these inefficiencies persist tends to be precisely because it is not clear that one can make money on them in a few hours or a day. But this analysis changes in the context of leverage. That is, the underlying ideas themselves don't require minute by minute monitoring, but when using a lot of leverage one has to monitor in order not to get destroyed as positions go temporarily against. That is a great argument in favor of limiting leverage for those who should do so. I no longer try to make money every minute, hour, or even day. I've tried it and it led to ulcers and chest pains. My congrats to those that have the emotional makeup to do it for a living! Of course, I also don't have clients who are demanding a fast buck or personal concerns over commissions. I take positions in companies that are going down roads I think companies need to go down in the face of assured future governmental and societal idiocy, in my limited and admittedly biased way. I don't use leverage and sometimes I have to wait months or years for the payoffs. But they do come. Sometimes. I do sleep well, and that can be priceless. "Those superstitious types who freaked out last year when the calendar read 06/06/06 will have something to smile about on the 7th day of the 7th month, 2007. Believing the triple appearance of the number 7 will bring luck, many people are planning important events for this first Saturday in July … Just as some people wouldn't dare get married on a Friday the 13th or live in a house with the address 666, believing in the positive influence of the number seven is just another technique humans use to have some jurisdiction over the chaotic world around them, said Frankfurter. "In our modern American society we have a tendency to look for magical ways to control the world or fate, so numerology is especially important for us," Frankfurter said. The obsession with numerology-and other para-sciences like astrology-tends to get stronger especially during significant life events … "It represents Americans' rather weak (compared to Asian cultures') attempt to exert some numerical or calendrical control over important life-cycle, transition, or other crisis situations,"…Lucky numbers also vary from culture to culture, proving, skeptics say, that coincidental connections between an event and the influence of a number can always be found if you're looking hard enough, no matter what the digit…"
Another appears in the Wall Street Journal. "In January 2005, NyLon Capital LLP of the U.K. launched with much fanfare a $1.2 billion high-profile hedge fund, backed by a blue-chip bank and run by some of the brightest stars of London's financial community. Within 15 months, the shine was gone…Claims lodged in the U.K.'s High Court allege that business decisions taken by the fund's top manager were influenced by an astrologist and a feng shui expert and this destroyed the relationships between the partners. The fund acknowledges that a consultant in feng shui, a Chinese geomantic practice, was employed and says the top manager is acquainted with an astrologist…Mr. Crapanzano alleged in another document filed in the U.K.'s High Court in February of this year that some of Mr. Burnell's business decisions relating to the other partners were influenced by France Jacoubet, a French astrologist. He said Ms. Jacoubet drew up horoscopes of all the fund's partners and employees to see whether they would fit into the company. Reached by telephone, Ms. Jacoubet declined to comment. Mr. Crapanzano also alleged that Mr. Burnell hired a feng shui consultant to conduct "good fortune" assessments of the fund's offices and oversee spiritual cleansing rituals, which involved placing small figurines of trolls, or ogres, in desk drawers and placing piles of sand and pebbles in the corners of the office…"
To the single guy, marriage is buying a put: a round bottom just below a long position. For ladies selling same, there is high initial opportunity cost but over time her position comes out on top. Theta decay results in long-term downward drift, with negative gravitational risk premium. The buyer's asset declines by half, and the seller - well the seller's asset appreciates. But never lie to the mistress. Today is one of those days where there was much movement in market, only to end the day practically unchanged. Makes me wonder: what's the purpose of such energy expenditure? A trader's ability to adapt to changing market conditions is the key to successful trading. While many praise foresight, they mistake incredible luck for incredible intelligence. A speculator succeeds when he/she is able to identify and take advantage of market inefficiencies. Trading books usually ignore the evolution of marketplaces. Traders pick up on any consistently successful strategy until it lasts before the cycle changes again. Short term trades that turn into long term situations often become the source of financial and mental agony. Sometimes you need to accept defeat and move onto new opportunities. I also read a proof of Mr. Sykes's self-published (why self- rather than Wiley-published is another thread) book on the plane back from Chicago last week, and here's my back-of-the envelope: I liked the book better than I'd expected. It's a fast and breezy read, and had a pleasantly candid and enthusiastic tone. Mr. Sykes comes across as an eager, hard-working, observant market participant with good hondling sensibilities. Several of his trading ideas, though generally not original/unique to him, are well-presented and explained. The one negative is the long digression about a private-equity situation that didn't pan out, which distracts from the main narrative flow. But I guess those are the facts he had to work with. For a market veteran, it's best read with an empty mind, without preconceptions such as 'what the heck does a 20-year-old know?' and can be enjoyed as such. Sounds fascinating. I would accept some overestimation of skill vs. luck, but generally many big money situations involve people's being in the right place at the right time — and the recipients aren't morons. But I couldn't see where to buy this book. I also had the opportunity to read an advanced copy of Mr. Sykes's book. I think there are several lessons here. Mr. Sykes sent me a flattering note requesting I review a copy of his book. I accepted; flattery works really, really well on my old ego. While I have not had the opportunity to read it yet, my wife found it very readable and illuminating from her lay perspective. Mr. Sykes is self-publishing his book, allowing him to keep a much higher percentage of the profits. The downside is he has to do his own marketing. He seems to have very effectively figured this out by using viral marketing and the wonders of the Internet to spread the word through blogs. It is nice to see entrepreneurship alive and well. The Interior Department will announce it is removing the American Bald Eagle, the most majestic bird, from the protection of the Endangered Species Act, capping a four-decade struggle for recovery. There was a time when the American Bald eagle's future was in grave doubt, with only 417 mating pairs verified in the 48 contiguous states. It was a victim of hunting and of excessive pesticide use, most notably DDT, which seeped into the ecosystem, killing the bird and its eggs. This time, American Conservatism got it right. It preserved a symbol that has carried through the founding of this country, and was established by the Continental Congress to be on the official seal of the United States in 1782. It has been worn with distinction by the 101st Airborne as its official patch, and has seen our armed forces through their most bitter campaigns. 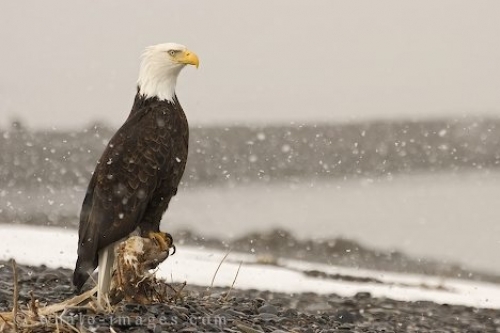 The bald eagle is the most powerful symbol of America we have. It is the national bird of the United States and appears on most of its official seals including the seal of the President of the United States. The Eagle is sacred in some North American cultures and its feathers are central to many religious and spiritual customs among native Americans. One never forgets the experience of seeing an eagle in the wild, spreading its majestic wings, with over a 7 ft span, and soaring with the currents above the mountains and the plains. It would have been a crime against nature to have lost such an amazing creature to excess and abuse. I just now caught a segment on the return of the eagles to the Catalina Islands. It appears DDT did the trick in eliminating them for decades. Today the chicks are incubated and hand-fed for weeks before being taken to the Islands. All of us need to take care of our precious resources and our native animals and birds. The stock meltdown of the last eight days, from an S&P500 index high of 1538.7 on 6/15 to a low of 1484.2 on 6/28, is highly similar in magnitude and duration to the 2/27 decline on subprime worries, the declines in May and June 2006 on inflation fears, and the decline in September 2005 with the major commodities firm. Apparently these 50 point selloffs are occurring with more frequency. The current decline started with fears of rising yields and presumably will end when the 10-year bond yield falls below 5% (and then some other bearish factor will have to be bruited about). I watched CNBC this week and found it enlightening. My impression on Monday and Tuesday was that the only time the market went up was during the advertisements — except when it was the advertiser who was interviewed on the program for his bearish views on Dow 5000 and long term yields and the economy, since his mere presence on the screen was good for an immediate 50 point drop in the Dow, and then when he gave his interview the market dropped a quick 100 points as he expressed his views on contagion, disaster, and why bonds are a better investment than stocks (in this he is apparently supported by his former disciple in Cambridge and, qualitatively, with his emphasis on the advisability of buying profitable disaster insurance, by the great coffeehouse philosopher and the Sage from Nebraska). Listening to CNBC one couldn't but fear for the country. Apparently everyone is in hot water. The Fed is in hot water because it has to show Washington it's tough on mortgages. The SEC is in hot water because it is seen as pro-business and hasn't cracked down enough on hedge funds. The hedge funds are in hot water because they're earning too much in fees. With so much hot water to fall into, it's amazing the market can do its job and maintain its normal drift during years when the yield differential is so much in its favor. If you can get 6% on stocks and profits are growing by 10% a year, that's 16%, and it compares favorably to 5% to most people, and the empirical facts that Tom Downing, Laurel and I report to support this must overcome. I think CNBC needs labeling like cigarette packs :"Watching CNBC can be dangerous to your wealth". My dad went up to the farm and reported back that the crops looked pretty good. The corn is not as tall as it normally is this time of year, but that's due the wet spring that resulted in a late planting — as much as a month later than preferred in some places, but still within the acceptable window of planting opportunity. We've had a fair amount of rain across Missouri as a whole, but mostly spotty storms. So a farm down the road could get an inch of rain while my farm remained dry. There isn't much to worry about at this time as far as the corn or soybeans go. As a matter of fact there seems to be reason to be optimistic. Temperatures are forecast to be moderate over the next 10 days, highs in the upper 70s - upper 80s. That is important. Corn doesn't like the temperature to be much above 95 and especially not for any long period of time. At night, they're forecasting lows in the upper 50s to as high as 70. That is good! Even if we don't get rain, those low temperatures will create a nice wetting morning dew, which of course is better than not having a morning dew! So keep your fingers crossed as we move into the hot part of summer. Watch the weather forecasts for rain. Picking up 1/2 inch of rain per week this time is the big key. Going more than 10 days in a row without rain is bad. Temperatures above 90 for extended periods of time is bad. Combined, they are a devastating to corn and bean but worse on the corn this time of year, as the corn enters the crucial tassling stage of its growth process. Beans can do with a bit less moisture and do a lot of growing when the rains come back in September and even October (depending on when they were planted). I talked to my farmer and he is optimistic. Well, as optimistic as a farmer can be. Keep your fingers crossed and pray for the rain to continue! Tonight I knew summer was here! Coming back into Belpre today I noted sacks of fresh corn at a little roadside market. The corn was picked fresh early this morning along the Ohio River at Reedsville, Ohio. It was delicious tonight with melted butter and freshly brewed iced tea. Corn in this country goes back to the Pilgrims. It was introduced to them by Native Americans. Corn on the cob will compliment any backyard BBQ during the summer months. There is a strong inverse correlation between the movement in housing stocks in one quarter, and the subsequent quarter's move in stock prices. I also find that there has been an enormous increase in real estate wealth in the past ten years, which is now a very efficient buffer to any sector set-backs. After all, a ten percent decline after a 300 percent increase is much better than a significantly slower yearly increase, in stocks or in real estate. As a second point, the sub prime market seems to be working well as a market. Prices are going up, and this is rationing demand. Those who made a higher than market return by lending at higher prices, are seeing some of that return dissipated. There are two sides to the market, and for those who are losing, there are always an inverse of people who are making money. Finally, there is always so much consternation about hedge fund losses, but they are usually zero sum to the extent that hedge funds don't buy and hold stocks. There is nothing of long term significance to the markets from Revco, Amaranth, and now Bear Stearns', demise. Do these problems compare to the loss of wealth from a flood or an earthquake? — of course not. Today will make eight new consecutive lows for S&P Sep. future contract. The last time was in May of this year with a happy outcome. The other rare occasions of eight new lows were mixed. Since none of this is very significant statistically and by reason of its rarity, a different approach, discussed by Nison in Japanese Candlesticks, about record sessions might provide an idea to consider. He says eight to ten record sessions is important and is called "bones of Sakata's body." Sakata was the city in Japan where rice futures were traded in the 1600s. He says buy after eight record session lows. So far today it would have been a good buy, but time will tell. Another interesting technique is the use of three-line break charts. These are similar to point and figure, but rather than use fixed box sizes, the three-line reversal must exceed the low or high of the prior three bars for a reversal. This way the reversal adapts to the market rather than a fixed system and might capture the changing cycles. Vic and Laurel tested point-and-figure and found some value. Perhaps the three-line break approach could be tested as well. A suggestion might be to trade it non-traditionally, in new ways that might be more profitable as suggested by Vic and Laurel's work, using point and figure in buying the pullback rather than the breakout as is traditionally suggested. Not really eight new lows — the gap-up on 6/15 and inside bar (to the prior day's true range) and then 6/19, also inside the gap day, did not really create new lows. A newly-opened Italian restaurant in my town has their staff park in the best parking spaces out front and then hires people to walk in and out of the restaurant. It's hilarious once you are there and you figure out what's happening. Last time I was there, we commented that it must really be catching on because the place looked busy from the outside. When we got inside, there was not one person eating in the restaurant's main dining area. The whopping ten or so people were all outside on the patio. I have no idea how many of them were hired hands, but I wouldn't be surprised if we were the only paying customers. We are treated very well and the food is excellent. Watching the marketing performance is a fun freebie! Roughly counting the day S&P September futures bars, it looks like it crossed 1400 about 20 times. We have 11 so far for 1500. This reminds me of the criminal defendant on the witness stand at his trial. His lawyer asks him, "How many times have you been convicted?" Defendant answers, "Six times, and this time will make seven." I just caught a segment on tonight's news telling how in 1907, Jim Casey with $100.00 began the American Messenger Company to deliver telegrams. The advent of the telephone killed that enterprise for Casey and he shifted gears and reorganized to become UPS and began to deliver department store packages. Then along came FedEx who offered overnight delivery service. UPS took the challenge and followed suit. Today UPS has 300 planes and is the eighth largest airline in the world. They have 94,000 trucks on the road and deliver 15 million packages per day! Impressive. Many people who have eaten venison have had a bad experience. It has to be prepared correctly, differently from beef. There are many ways to prepare venison. If you're going to cook steaks, use the tenderloins ("backstraps" in deer hunting vernacular). And no matter how well done you like your steaks, cook them only to medium at most. Venison is much leaner than beef so don't overcook it. Feel free to marinade it in advance. I like a balsamic vinegar, garlic, onion powder, salt/pepper marinade. I enjoy roasts of venison too. The best way to cook a venison roast is in a crock pot. Use whatever seasonings and vegetables you like, and make sure there's plenty of liquid in the pot, otherwise it will dry out. If you choose to marinate the roast in advance, start the night before, then put it into the crock pot in the morning. I love venison jerky — good, smoked peppery whole muscle jerky, which beats the pants off processed venison jerky sticks. I could eat spicy whole muscle jerky for breakfast. I share our venison with family, friends, and the needy (via FHFH Farmers and Hunters Feeding the Hungry) but one thing I won't share is jerky! I even hide it from my kids! Another treat is venison ground up into burgers. I don't add any pork or beef to the burgers. And I make venison chili, venison spaghetti, and (my personal favorite) venison sloppy joes (my mother's recipe — my favorite meal the whole world!). I also get some venison breakfast sausage (a real treat) and summer sausage, too. There is plenty of 100% fresh venison on my farm — it just needs a sharp arrow or a fast-moving piece of lead to bring it to the dinner table! So, come visit! My mom learned how to make her recipe for sloppy joes in the Campfire Girls. Since we were kids, mom would cook whatever we wanted for our birthdays. She never had to even ask me what I wanted; it was always her sloppy joes. When I got married, I didn't even have to ask my mom to tell Gwen how to make it. Mom just went to Gwen and gave her the recipe and told her that this is a meal guaranteed to make me happy! When I mentioned to Gwen that she needed to learn the recipe she informed me that she already had it. I love my mom's sloppy joes! The recipe is based on 1 lb. of beef, although we use only venison in our house which I think is even better! Mix the onion in with the venison and then brown the venison. Drain the meat of grease and then dab it with paper towels to get excess grease off. This is the key: my mom would add 1/2 cup of sugar (but I recommend that you add to taste). My wife and I have altered it a bit and we use organic honey to taste. We try and use all organic ingredients. I prefer to start out by eating a couple of sloppy joe sandwiches on organic whole grain bread. After that I like to scoop it on my plate and eat it with a spoon. This is an easy and simple recipe to make and I promise you that you'll enjoy it. My mom is no longer with us, but her memory lives on every time I enjoy her Campfire Girls sloppy joe recipe! Kailua-Kona, Hawaii is the world's capital for big game fishing; 1000-pound fish are common. It's summer and the catch is on. On a typical gamefisher, a 35-64 foot luxury sport yacht, they will run four lures on four poles, one short corner three or four waves back, one a bit longer, one out deeper and one in the far corner about seven waves back. With the lures in we have a good depth for action and if they are hit the line won't get tangled and when the boat turns, the lines won't cross. When a lure gets hit, it's "fish on!" and time for a long fight. When fishing for big game in the market, I sometimes run lures under at varying depths, say three to seven waves back, hoping to catch some big game. Sometimes only the short lure gets hit. Sometimes all the lures get hit at once and there is a lot of action with hands full and it’s time for a big fight. The boat industry is somewhat bifurcated, as the high end seems to hold while the blue-collar powerboat side is soft. Diesel in the south Chesapeake Bay is near $2.55, while in resort areas with good sport fishing in NC and VA Beach it can run $3.55 or more. After seeing Harborfest and several weekends of boating in the bay, I would say the shock of higher prices last year is wearing off for the fishing-oriented. As my friend who has run a 62' Buddy Davis off Delaware says, "Fuel is the cheapest part of owning a boat. If you cannot afford to fill it up, it is time to sell." Tuna, mahi, and wahoo are running nicely off VA Beach and Hatteras this week. Grilled a friend's tuna catch last night with cilantro and lime over pecan wood. It's mahi or crab night at the Bay tomorrow. Our neighbors have so many blue crabs, we're getting dozens (not cheap this year either) just so they can clear the way for the ones in their pots. Around Kent Narrows, the Bay has been very busy. Mostly go-fasts and upper end cruisers. As Prof. McNabb noted the high end is fine. They have enough to afford what they want. Middle class, mid sized fishing boats, and center consoles are seen a lot less. Sailing is very active out of Annapolis but those cheapskates use the wind! It's not just a legend about the cheapness of sailors — having worked in, owned part of and spend a lot of time in waterfront bars, the difference between a tip from a sailor and a power boater is in the 100% range. Large Vikings are selling very well, as are the Cigarette-style boats, especially Sonic and Formula. The after market in Intrepids right now is actually higher than original sale price. One interesting result that may mess up a lot of thinking about the relationship between bias and stake is that whereas many relatively small horse betting markets display a favorite-longshot bias, the biggest of them all in terms of pool sizes, Hong Kong, does not — and it once had a reverse bias (favorites were over-backed relative to longshots), but this disappeared in around 1990. I suspect, and hope to demonstrate sooner rather than later, that this bias is due not to psychology, but to information asymmetry. I have already found (with Barbara Luppi) that Hong Kong bettors do display loss aversion. Now since there is no favorite-longshot bias, the latter can't be due to prospect theory or other such behavioral mess-ups. Size of stake is relative. It is "in the eyes of the investor." A wealthy individual may view a $1m stake as small, whereas a middle-class investor might view the same stake as enormous. As described in Fortune's Formula, large, "scientific" gambling syndicates migrated to Hong Kong because of the larger pool of money available, which may at least partially account for persistent anomalies being rigorously exploited away. The syndicates have removed the reverse favorite-longshot bias, but are even more loss averse than the regular outsiders! The hedgefund-broker symbiosis co-dependence is obvious, but it is still interesting to see graphically. The basic premise of the book The Only Three Questions That Count by Ken Fisher is that only knowledge that is yours exclusively will help you make money in the markets. In his attempt to carry his point, Fisher gives anecdotes of occasions when what investors were taught was wrong, and contemporaneous charts that attempt to indicate the weakness or inadequacy of many of the things that investors believe in, (including, that yield curves are predictive, that presidential cycles matter, that you should buy when the media is bullish, that you should sell when there is fear in the air, that high price to earnings ratios are bad, that deficits are bad, that seasonal analysis works, that high gold prices are bad for inflation, that value stocks are better than growth, that a sinking dollar is bad for stocks, that the VIX is predictive, etc.). Fisher believes that the reason we believe so many false things is that we are hard wired to fear heights, we tend to believe that what has happened in the past will continue, and we place undue reliance on authority. These reasons are offered up along with a dozen other shibboleths and unproven assertions of the behavioral/finance experts, who scientists like to call the promiscuous asseverators, because of their tendency to pull out one ad hoc hypothesis after another based on experiments in laboratory or college settings that have some explanatory power for some or other anomaly. Fisher has a host of his own beliefs that he feels are true, and he gives many anecdotes, reports of performance analysis, and examples of columns that he wrote for Forbes, as well as a report of a ten year performance that beat the S&P by two percent a year after fees. In this way he feels like almost every other book that I have read in the last 20 years on this subject, including those on point and figure analysis. He shows that all movements are due to supply and demand, that capitalism is good, that the market has a tendency to go up, that an earnings yields greater than a bond yield causes merger activity to increase and thus buoys up stocks, that the French are bad and government spending is bad, that some sectors of the economy (like health care and consumer staples) are less volatile than the market as a whole. All of Fisher's assertions are based on similar chart analysis, and selected anecdotes, to the beliefs that he decries. Some of his ideas are rather startling and original, including his view that an ensemble of forecasts as to how much a market like bonds or stocks will move during the year has much predictive value. He believes from a few self reported successes and anecdotal references that if there is a 'space' within which there is no forecast, then that is highly predictive of where the market is going to end up. Another original idea of Fisher's is that he can predict bear markets by the extent, enthusiasm and pricing of IPOs — Fisher pulls no punches in this book, and he tells you what he thinks about almost everything! He is down on mutual funds, because of their high costs and high frictional costs, he hates the French and thinks we can do anything better than they can. The same goes for government, and academics he mainly has contempt for, as to their practical abilities. He feels that Buffet is highly overrated, and Hank Greenberg is much abused and underrated. He loves everything capitalist, and is a big fan of international diversification. The book is replete with endless direct and indirect plugs for his management services, and Fisher reports an excellent track record over the last ten years, for both his picks on Forbes, and the after fees record for his clients. In by far the most valuable part of the book, which has nothing to do with the three questions about what you know that others don't, and what behavioral finance biases you suffer from, he has a nice discussion of how a person should balance the need for cash flow at various stages of his life against a terminal value to leave to his younger loved ones. He also has some sound advice about the flexibility of selling losing stocks to offset gainers when you manage your own portfolio. The book, and Fisher's approach, suffer from several grave defects. He asks at the end of the book for readers not to criticize him unless they have done some pencil and paper work, yet since almost half of the book seems to be a recap of what Laurel and I have written about in our two books and 700 columns, and documented with proper statistical analysis, I don't believe I would be remiss if I critiqued it. The main defect of the book is that there are a host of assertions in the about what works and what doesn't work, but they are not tested, thus, it is impossible to ferret out the one or two grains of valuable information from the totally worthless. Fisher's main thread is that everything depends on supply demand, but this is what every book on investment says. The problem is to predict supply and demand, how it will change, and what is already anticipated in the price. Another main thread is that investors are subject to regrets and pride, and that these two tendencies are hard wired into our brains, along with our fear of heights. This apparently makes us buy when it's high and sell when it's low, but the evidence that this causes mistakes in stock market judgment and that it isn't accounted for by tens of thousands of psychologists and economists and their clients, is flimsy at best. Fisher is one of those authors who is awed by high-school mathematics. He gives an example of how to compute the profits from an 'up two years and down one year' scenario, and wallows in how the formula, which every high school student is supposed to know, is of the higher mathematics. Fisher's discussion of the difference between a geometric mean and an arithmetic mean, and how the former must always be lower than the latter, is woefully misleading and inadequate. Also inadequate are his frequent uses of perfect information to show that if you knew when a market was higher than it's low, it's likely to have shown quite a rise. One of the major messages of the book — that despite the tendency of the market to go up by 10% a year, the average investor by computing correlation coefficients can somehow predict when to get out of the market or reduce his exposure — is very fuzzy indeed. The foreword to the book has one of the strongest recommendations that I have ever seen for a book, by Fisher's friend, Jim Cramer. Cramer himself says that this is not only the best book that an investor can read this year, but that it's much more valuable to read this book than to listen to his shows at all. He admits that the book changed everything he's always believed about the market and contains many a critique of his methodology. It is regrettable that the book has so many lapses in its analysis, so many unsupported assertions, so much anecdotal evidence without any statistical analysis or awareness of uncertainty, variability, retrospection and multiple comparisons. Because of this the average reader is, unfortunately, likely to come away from this book with as much bad information as good. As a final positive note, one thing that Ken Fisher claims in his book that sounds true to me, is that any fear that is widely broadcasted in advance will have no impact on the market. Or perhaps in more predictive terms, to the extent it's influencing the market, it creates a bullish situation because it's already encapped by the price, then price will increase when the fear subsides. Fisher gives many examples to carry his point, and if it weren't so hard to quantify this, and there weren't so many highways and byways to tie down, this would be a very good thing to study. I feel that this point is highly relevant to sub-prime, and also to the asset seizure on the brokerage house that is famous for seizing the assets of its own customers, (how ironic). 1. What do you believe that is actually false? 2. What can you fathom that others find unfathomable? 3. What the heck is my brain doing to blindside me now? The essence of the first query is that the media continually spews forth a kind of pop economics much of which is exactly wrong. If one avoids listening to the meme du jour and does the research personally then the much of the media silliness can be avoided. Simply eliminating the wrong and hurtful memes can improve one's investment performance. In considering question two the author points out that there are many data sources available on the Internet which even relatively unsophisticated people can access. He describes how to calculate a correlation coefficient, a job which is done by a spreadsheet or stat program. Unfortunately he fails to mention the spurious correlations which arise from calculations based on levels. This is the most serious flaw in the book. Most of the evidence produced is based on correlations calculated on levels. In his discussion of question three the author resorts to teachings of behavioral finance. This field is one I find suspect. Much of the empirical work is subjective. The analysis and explanation of the subjective results requires a Byzantine set of rules and rubrics to explain the evidence. Fisher also quotes some obscure papers in behavioral finance which he co-authored. Having said this, there is still much to be said for studying human psychology as it is reflected in the behavior of markets. The book offers a relatively pop account and explanation of the vocabulary of behavioral finance for the uninitiated. As the Chair has recounted, the book is a thinly disguised pitch for the author's investment advisory services. His service is essentially oriented toward tracking the MS world index. The philosophy is to track the index as closely as possible and only to deviate when his three questions indicated that he should deviate by over weighting or by under weighting a sector or country. He calls these deviations "side bets." Generally his track record has followed the index in recent years but notably not underperformed overall. This book is an irreverent, opinionated discourse on investing and researching market ideas. There are many pearls of wisdom and some notable flaws. Overall it is a fast and fun read and offers many macro economic hypotheses. Because of the technical flaws, testing the hypotheses should be viewed as an exercise for the reader. I suspect much of Fisher's book was ghostwritten, probably with an eye to marketing. His Forbes column is occasionally intelligent. However, I lost most of my respect for him when I gave my name and address to his company, and was swamped by primitive and hucksterish marketing pieces in the mail for some time afterwards. Makes me think of the Little Book of Value Investing, allegedly written by Christopher Browne. A true value investor would never pay for it, given its small pages, large type, and lack of new ideas. Sounds like marketing committees at investment managers are demanding that their figureheads publish books on investing. There are many old daily articles from 2001 Chair and Laurel on Worldly Investor. I am having fun tracking the articles along with the daily chart and reading about their work on the markets. It is a very educational supplement for those still hungry for more after Practical Speculation and Education of a Speculator and shows them at work in a tough market. The market calls are uncanny looking back with 20/20 hindsight. Too bad we still don't get the great calls. Now we have to do the work ourselves. It’s probably better that way. It's funny but it doesn't work following someone else's calls. There is no confidence without doing the work yourself. Recently, I had a chance to go to an Italian restaurant in the area. Some friends indicated it as a place where you can have "genuine" food. Normally, I do not go to Italian restaurants abroad. Most of them adapt their cuisine to local tastes. Or they do not have an Italian cook. Or they do not use original Italian ingredients. Or may be all of it. In this case, the food was fine, the ambience was great. The owner, a man close to his sixties, emigrated to the USA when he was 18 years old. Needless to say, he had nothing when he arrived. He started as a waiter, then opened his own place. He made money. Good money. As a matter of fact, the restaurant is quite popular. Last night I went there again and we started to talk about Italy. He comes from Calabria, a small village in the mountains. His mother is still there. His mind is still there. He almost cried recalling the places of his childhood. In a place that was not able to give him anything but a chance to leave. His dream is to go back to Calabria and buy a hotel on the beach to offer wedding services. He thinks that he can bring, along with his hard-earned money, the organization and methodologies applied in the US. He thinks that the heart is more important than the head. What is amazing is that even his children, who were not born there, would like to return there. But Italy is not what he left behind. He is not any more the man who left his country more than 40 years ago. He is idealizing a place that now exists only in his mind. Many times you see people who emigrated come back to their homeland after they succeed in life and get older. Often they fail. They lose what they have accumulated. They cannot adapt. Leaving your country because of necessity is hard. But America gave him much more than his country could give him at the time. The American dream is here for him. It is realized. I tried to convince him to go back only for his holidays. Maybe long holidays. The reality is that he belongs to here more than to Calabria now. But I left the restaurant with strange feelings. Who am I to judge his life and his dreams? I have no friends and no enemies — only competitors. One of the major differences between master and amateur chess players is in the way they perceive threats. Amateurs have a tendency to defend against everything and anything, largely due to their inability to calculate to the end and distinguish the real from the imaginary. So the bluff carries great weight at lower levels, often resulting in both sides defending against imaginary threats as if both were participant in a game of blind man's bluff. On the other hand, the intrinsic worsening of their positions by small mistakes and inefficiencies is often not noticed at all, usually resulting in quite the wrong diagnosis as to why they lost. 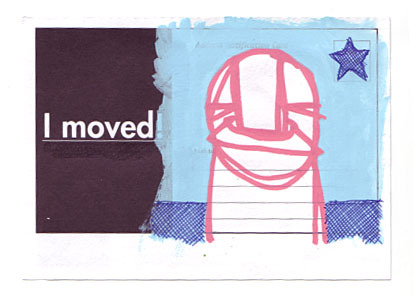 Often it's put down to a single move when in fact they were on the wrong course for some time. They then eventually find one of the blunders which becomes ever more common in dodgy positions. "We catch so many fish that the different salmon species no longer return. Once we've exhausted one species we move on to the next," Alexander said, offering me a spoonful of orange salmon caviar and a cup of tea. Observers believe more than 100,000 tonnes of salmon a year are illegally fished. They are mostly taken for their caviar, which sells for 1,000 roubles (£20) a kilo. The fish are thrown away. "In 1992 we caught 35,000 tonnes of king crab. Last year it was 3,400 tonnes. We need to stop fishing crab now if the species is to survive," Mr Vorobyev said. In the Bering Sea, on the east coast near the foggy town of Petropavlovsk-Kamchatsky, illegal Japanese trawlers have cleaned out the pollack. 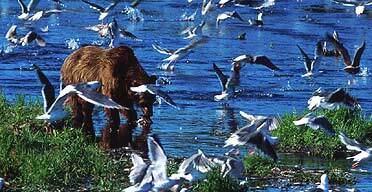 Kamchatka has about 12,000 salmon-eating bears — the largest population in Eurasia. But they too are in trouble. In April and May American hunters using helicopters and snowmobiles shot 300 bears - a perfectly legal pursuit costing $10,000 (£5,000) per dead bear. Illegal hunting accounted for another 600. My best friend since kindergarten has a filter business. He has a clientele of businesses that he goes to and changes the filters on their heating and air conditioning units. It's a steady business and affords him time to go hunting and fishing. But it's also a luxury business. Since people don't need their filters cleaned, if they are experiencing any financial difficulties, they usually cut him back or even stop his service altogether. He and I were talking on the phone today and I asked him how his business is going. He said he's having to work harder to bring in new clients to make up for the one's that either cut back or cut his service off completely. He informed me that times were tough right now in his normally steady as a rock business. He said that there seems to be a direct connection to his prosperity and the price of gas/oil. His filters are petroleum-based and the prices of his filters are up 25%. Plus he drives around all day between his businesses so the price of gas affects his bottom line. But the biggest thing that affects his business is gas over $3/gallon. He said there seems to be a direct psychological effect on people when they see gas go over that number. Sure, the increased prices affect his bottom line, but when gas gets over $3/gallon, customers start cutting back or canceling his service. He says the business attitude and environment are completely different when gas is under $3/gallon than when it's over $3/gallon. And even though my buddy has a blue collar business and gets his hands dirty for a living, don't think that he's some dummy. He's a sharp guy with a good business sense and a better people sense. But he's not very bullish on the economy right now, and since the core of his business is serving other mom-and-pop businesses, he's got a good feel for what is going on in. So, to lessen the chances of me being a labeled a bear, I would submit that the focus of this would be (as always is the case with me), ‘how do we profit best in this environment?’ I'm not asking that rhetorically. One thing I'm considering is doing something with my buddy. He's getting burned out on his current business and is considering selling it. He's not sure what he wants to do, but he's got a nose for finding things. I wonder what opportunities are going to be popping up in the coming economy? I'm going to keep my eyes open for them! Especially opportunities that create passive income streams. My feeling is that the US is split between those who have a lot of money or owe a lot of money. To profit from the latter, I got some ideas from an article on publicly traded debt collectors, Two Stocks Poised To Profit From A Debt Collection Boom. I don't own the stocks mentioned yet, but it's an idea I'll investigate further. The risk to these debt collectors is that the politicians change the rules of the game. "The first principle is that you must not fool yourself — and you are the easiest person to fool." Richard P. Feynman, Caltech 1974 Commencement Address. Feynman gave several examples in his speech to the graduating students on the proper use of the scientific method. His speech still rings true today. Reading his discussion of "Mr. Young's" rat experiments in the 30s reminded me of JL's "mice". People often rely on intuition and experience to reach (jump to) quick conclusions — and many times things work out OK. There is a risk as Feynman points out, however, of being snared by "cargo cult science" if you do not examine the assumptions, hypotheses attached to your or other's observations and data (even previously published and accepted data). Feynman's mental discipline is admirable. I struggled with choosing whether or not to rent Rocky Vl. Stallone at 60, fighting again as Rocky, was this going to be just a low budget grab for cash by Stallone? It wasn't the best Rocky I've seen. I doubt you could top the original which launched not only a franchise but a whole career, and re-charged the psyche of a nation that was beaten down by Vietnam, double digit inflation, Watergate, and high unemployment. America needed something to feel good about besides trying to celebrate our bicentennial. In many ways, Rocky l did just that. I found it interesting that Rocky Balboa didn't take the low road and just take us on an emotional roller coaster. But Rocky remained humble and kind. He maintained his uneducated, limited vocabulary, positive philosophical street-smart self. We were taken on a ride down memory lane. He reminisced about his beloved wife Adrian, who is deceased in this movie. I especially like the way the inevitable fight scene is handled. Rocky Vl added a touch of class to the end of the franchise. Rocky goes out as a humble man, a class act that gets the credit he deserves. It's too bad that this movie didn't get the credit it deserved, for that reason alone. Rocky gave us a character that demonstrated kindness and compassion. Rocky was humble (except for the first part of Rocky lll) and never seemed to forget his roots. Further, I believe he gave us a demonstration of how to take the gifts that we are all given, our talents, if you will, and magnify them to achieve all that we can achieve and use not only our physical talents but also our mental talents, and how to combine them to succeed by having the right philosophical foundation from which to draw. In my humble opinion, that is the greatest gift that the Rocky franchise gave to this nation, a nation that so desperately needed it. If you watch Rocky Vl from that perspective, you will be pleasantly surprised! On my 10 point scoring system: For entertainment I give it a seven for the both the kids and adults. I give it a Prudish Dad of 8.5. There was no sexual innuendo in the movie. There were a few curse words, but none were too bad. There message of the movie to today's youth (and adults for that matter) is worthwhile too. I recommend it to parents and grandparents. Barring a big week next, we have a down June in stocks. This is the first down month since Feb 2007, and they have been quite scarce. Through Feb there were only two down months since the beginning of 2006. The waits ranged from 1-11 months (11 was Oct 95, and tied for 2nd longest Feb 07 wait=9 mo). Assuming up then down month, what came next? The first row is mean of all months after UD, showing positive. The second row is just 1/04-present. Just cant wait for next week…. Mr. Richard Fortman is in his early 90s and can be called the Dean of Checkers. I visited his home a couple of years ago and took him and his wife Faye to lunch. He showed me his checker library and ran up some play for me. His books on openings, Basic Checkers, is a mainstay for three-move enthusiasts. 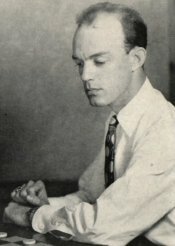 Joe Schwartz who won 10 and drew 10 in the recent International Match and was the highest US scorer credits the study of Basic Checkers to his dramatic success. Mr. Fortman below replies to my query on Mr. Matthewson and thought you would enjoy his reply to me. Christy Mathewson was before my time, however, my coach Harland Richards once met him while on a business trip to Boston at the local checker club in the early 20s. He said Christy's profession was baseball and that checkers was just an enjoyable hobby. He liked to entertain his teammates on long train rides to the west coast by playing them blindfolded. That is an art not given to all, as you know. Although Tinsley, Ryan, Banks, and Lieberman were adept, other masters such as Long or Hellman were not. Richards suggested a game but Christy declined (no time) but did autograph a scorecard for him. There is a photo that shown Christy playing Sunset Bell with members of his team as spectators. I was told his board and checker set are in the baseball Hall of Fame. I don’t ever recall seeing a published game that he played. Gassed in WWI, his life was cut short. There is a proposal before congress (H.R. 2755) to abolish the Board of Governors of the Federal Reserve System and the Federal Reserve. This is the second time, it seems. The first time was in 2003. I'm starting to become a Ron Paul fan. But I'm worried about what I've referred to as the Russia effect, meaning that Russia melted down into chaos after they went straight from socialism to capitalism resulting in anything but a capitalist society. As much as I want to abolish the IRS and 99.99% off all government agencies, what thoughts are there on us melting down into chaos if that were to occur, i.e., abolishing the fed? "Russia melted down into chaos after they went straight from socialism to capitalism" is not a very good description of what happened after the U.S.S.R. formally dissolved. Runaway drunkenness, near demographic suicide by abortion, absenteeism rates that made Lordstown look like a Toyota factory, extortion so much a part of ordinary life that someone's not demanding a bribe was cause for paranoia, had all been part of Russia life even before the defeatism and self-doubt that came after Afghanistan. Scott's post assumes that Soviet governmental authority had some moral force in 1988. It had none. None of us can predict the future, but I would argue that the odds for Russia's future are as good as those were for what used to be known as West Germany in the 1950s. Then there were no local German politicians who could pass muster as anti-Nazis, and the new republic's democracy was a very brittle artifact. If Russia's current leadership seems tainted by associations with the old tyranny, that situation is little different from what was happening under Adenauer. Ironically, Scott is far more likely to see Ron Paul's monetary regime created in Russia than in the U.S. I leave it to those who really know about currencies to correct my usual amateur errors, but it seems to me that the ruble is the one world currency that can currently be seen as being entirely backed by a gold/petroleum standard. Hmmm…with regards to Russia, the so-called "free/ democratic institutions" that "evolved" were anything but. It's one thing to have measured, organic evolution of a free press and robust markets as the US did. But in Russia, the robber baron tycoons immediately built up media machines to massage their public images. Putin destroyed Russian "free media" because it was Boris Berezovsky's tool, and Berezovsky probably achieved greater control of the Russian economy than the Politburo did (with lots of help from Chechen gangsters, car bombs for his competitors, Russian government force, and other ridiculously coercive methods). The admiration that the official American press (Time, WP, NYT - the usual suspects) showed for the "free/democratic institutions" that Professor Sachs helped "create" (sic) has its historical match in the obtusely wrong-headed enthusiasm that the Jeffersonian press showed for the progressive insanities of the French Revolution. Both Stefan and Alex are doing a better job of making the point I was trying to make. These countries were run by demagogues, despots, and gangsters who simply changed their styles, but ultimately remained in charge. They changed from being in charge in the form of a government to being in charge in the form of being the most powerful gangster. The gangsters, of course, whether under the guise of a legitimate government or as just plain gangsters, were able to manipulate powerless people because the gangsters had made them dependent on them. In the US we don't have gangsters in charge per se, but we do have a system where a large group of people like welfare recipients (no offense intended) who are dependent on the government. So I ask if a country can go from a "dependent system" to one of independence overnight? If not, then how does one move away from that system? Just in personal experience, I'm 21, I trade about 150k total in political futures (snobbier people would call it "gambling," I laugh at the pseudo-distinction). To get even the most rudimentary legal structure (a "pooling of interest") to facilitate moving the money offshore, (because it's simply stupid and/or prohibitively expensive to risk regulatory harassment over high-risk, novel securities trading in the United States, without the economy of scale of a tens of millions of dollars of a capital pool), I had to utilize the services of two accountants and a securities lawyer. Fortunately I had friends of the family to do it for me, but what about someone who isn't as privileged as I am? Legal overcomplexity is an incredibly high fixed cost/ barrier to entry in this country. And I don't even have day to day interactions with other people, unlike the Korean immigrants in DC who got sued for $100 million because they refused to give a lawyercrat a $1000 new suit, or the cerebral palsy doctor ruined by John Edwards. I will let Alex speak for himself, but that is not the point I was making, Scott. No ordinary Russian thinks that the changes over the past 20 years have been merely a change of styles by "demagogues, despots and gangsters". For one thing, there is now actual freedom of conscience. (Yes, I know the Russians are giving their own national faith preference and have been less than open to proselytizing by Westerners; but that is a world of difference from the situation that had Jews, Seventh Day Adventists, and devout Orthodox regularly jailed simply for what they believed.) It is also now possible for people to have savings that are not controlled by the government and private land ownership. These are real changes for the better that have affected millions of people, and they are occurring. But at the same time the conditions of actual life continue to be dreadful. As for the question of dependency, that seems to me a near universal. I have never known a libertarian who actually turned down the offer of a good government job. As the first Mayor Daley once said, "Everyone wants a little honest graft." No society has ever reached that peak of pure individualism that Ms. Rand dreamed about, but we can hope for a world with enough contending interests to limit the amount of loot that any one group can haul away. Russia went chaotic, yes. But most of Eastern Europe did not. Why? The rule of law. Besides, there is no reason why abolishing the Fed would create a chaotic situation. Russia went from a closed-economy kleptocracy to an open-economy kleptocracy. The commanding heights of Russian industry never saw capitalism. The looting, aggregation, and export of its wealth are well-chronicled. Using the word "capitalism" in the context of Russia is to deliberately smear the term as gangsterism. The Federal Reserve, when set up, was ostensibly created to maintain a stable value for the dollar. Looking at the 90%+ drop in the value of the dollar since the creation of the Fed, I'd say there's reason to doubt their somewhat self-serving perspective. A look at Panama, where there is only nominally a central bank, may be instructive as well. When Queen Elizabeth I came to visit the United States after WW II, my grandfather, who was born in Old Serbia, wrote about the news to my dad, who was born in the coal camp near Ludlow, Colorado that has now physically disappeared. In his letter Tata wrote to his American-born son that "your queen" is coming for a visit. What he meant was that Americans, regardless of their origins, end up having an Anglo-centric view of the world - at least as far as Eastern Europe is concerned. The Hungarians, who were fervent Nazis and are more completely thorough anti-Semites than anyone to the east, got a better press in London and New York in 1946 than our allies, those awful Russians. They still do. The economic successes in Eastern Europe - Croatia, Slovenia, Poland, Hungary and the Baltic states - have far more to do with their proximity to Germany, Austria, and Scandinavia than with any special qualities of jurisprudence in "eastern" Europe. For their citizens and for the average Rumanian, Serb, Bulgar, and Ukrainian, the rule of law is no better than it is for the average Russian. What is better for all of them is that now the police are merely corrupt; they are no longer true Marxist believers dedicated to liquidating all class enemies. Russia went chaotic, yes. But most of Eastern Europe did not. Why? The rule of law. Can't we simply start with the IRS first as a warm-up? Having spent the first 20+ years of my life in Eastern Europe (Romania) and being exposed to the first 13 years of transition from communism to capitalism, I can second Scott's comment about the melting into chaos in all Eastern Europe, not just Russia. The looting was mind-blowing and cannot be explained if you didn't live it. With rampant inflation, no social net whatsoever for maybe 80% of the population and opaque legislation, I'm surprised things didn't get more explosive in all these years. I personally witnessed two national distribution companies with strong brand names and infrastructure vanishing in two weeks due to central bank's policies on the exchange rates. And this was '99 - '00 after 10 years of "free market economy". Unfortunately, fundamentals haven't improved much despite the real estate boom and commodity prices run-up masking an economic growth that is not healthy. High profile businessmen - bank presidents - still get shot in daylight in Bulgaria, (the country is a member of EU for six months now… what a joke) due to their affiliation to organized crime (there is no other way to run a business). Imagine Sandy Weill getting whacked in a drive-by shooting to understand the strength of their banking system. I expect the majority of "emerging markets" money managers to be separated from their wealth in the foreseeable future due to their lack of due diligence and reliance on official statistics. The National Park Service has finally opened the Ulysses S. Grant Historic Site at his wife's family's farm - White Haven. "The country having just emerged from a great rebellion, many questions will come before it for settlement in the next four years which preceding Administrations have never had to deal with. In meeting these it is desirable that they should be approached calmly, without prejudice, hate, or sectional pride, remembering that the greatest good to the greatest number is the object to be attained. A great debt has been contracted in securing to us and our posterity the Union. The payment of this, principal and interest, as well as the return to a specie basis as soon as it can be accomplished without material detriment to the debtor class or to the country at large, must be provided for. To protect the national honor, every dollar of Government indebtedness should be paid in gold, unless otherwise expressly stipulated in the contract. Let it be understood that no repudiator of one farthing of our public debt will be trusted in public place, and it will go far toward strengthening a credit which ought to be the best in the world, and will ultimately enable us to replace the debt with bonds bearing less interest than we now pay. To this should be added a faithful collection of the revenue, a strict accountability to the Treasury for every dollar collected, and the greatest practicable retrenchment in expenditure in every department of Government." …a proposal for streamlining addresses, wire destinations, etc. The average person probably spends about a year of his life filling out forms with his address, filling out change of address forms, filling out wire instructions, etc., etc. Every geographic living space or business location applies for and is assigned a unique number, the "geo-number". The mapping between number and location is kept on a public database. Every individual or corporation’s address is assigned a unique number, the "res-number". At any point in time, all the res-numbers map onto a unique geo-number. The user's res-number typically stays a constant, but he can change its mapping onto a new geo-number when he moves. Your mailing address would be your res-number and would never change. Instead of filling out 50 change of address postcards when you move, you would just go to the database and change the mapping of your res-number to a new geo-number. Every bank account, brokerage account, etc., would have a unique "acc-number". Instead of filling out complicated wiring instructions, you'd just request a wire to your acc-number. The database would have a mapping of acc-numbers onto specific wiring instructions. The instructions could change with time (e.g. if Schwab starts using Citibank instead of Bank of NY), but your acc-number would remain a constant. While I'm at it, I'd also ban pennies, nickels, and quarters, and just keep dimes and perhaps 50-cent pieces. Financial writers refer to liquidity. What is it? As of this writing on Friday afternoon at S&P September 1518, Globex cumulative depth shows around 3000 on each side with fewer than 1000 bids or offers at the various levels. Time and sales show orders of 1000 and more are fairly common and such an order might take out several levels. Contrast this to 20,000 cumulative depth per side at market tops and trend days up. Right before the FOMC announcement liquidity dries up to lower amounts, which is followed on the announcement with large movements. The last few days have seen larger handles. Is it just the hot mid-summer and all the big traders are out in the Hamptons, or is something else at work? Last night and tonight are midsummer nights following the solstice. More than cool reason ever comprehends." From A Midsummer Night's Dream, William Shakespeare. I just heard on the nightly news that Ohioan Bob Evans passed away today. I met Mr. and Mrs. Evans at a political dinner some years ago. He began his career in restaurants with a small diner he owned in Gallipolis, Ohio and ran the grill as the short order cook. He has a farm in Rio Grande, Ohio and each summer has Bob Evans Days there. 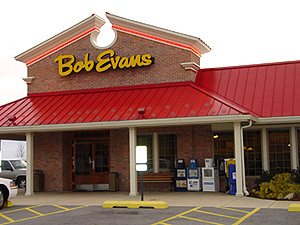 Mr. Evans built a multitude of Bob Evans restaurants across a lot of America and the food quality is always consistent with a down-home and friendly atmosphere. I dined at one this past Sunday and enjoyed my visit as always. We have lost another entrepreneur and the world has lost one more consummate businessman. June 21 (Bloomberg) — Two U.S. lawmakers asked the Securities and Exchange Commission to delay Blackstone Group LP's initial public offering until Congress holds hearings…. I wonder if Blackstone CEO Schwartzman regrets all the time he's put into beltway schmoozing, being chair of the Kennedy Center, and all that. At a time like this, one hesitates to do anything but say something descriptive. The Dax broke below 8,000 today, but came back to 8,050, and bonds were down as low as 106.04 and have now recovered slightly, to 106.13. The Dow went below 13,400, to 13,398 for an intra-day negative sequence, and yesterday set a negative reversal of one, with its close below 13,500 at 13,489. The grains are down about three percent from their recent one year highs, with corn near $4, after being at $4.20 a week ago. The open in stocks was particularly confounding, just about unchanged at 1326.7 after closing at 1327. Almost all big moves down in the last year have been greeted with big rises the next day, with Wednesday June 6th being the exception, when there was a decline of 17 followed by a decline of 28 on the Thursday. There was a grave decline in the afternoon yesterday, which will have all weak hands very frightened, and there must have been considerable margin selling at 10a.m. today, as the S&P and Dow hit their lows, down about half a percent on the day. A slaughter has taken place during the morning. Everything from St. Paul to Coxey had broken ten, twenty, thirty, or even forty points [those were the days: shades of 1987 — Vic]. The faces about me were those of lunatics, not sane men. Standing next to me was a man who ha seen the last of his fortune swept away, and another was pacing up and down the room muttering to himself: "My God, I've lost $30,000." The panic had come and passed so quickly that if my orders had not been entered in advance I would have stood no change of getting Steel at my figures. I bought my Steel at $25 a share, and the lowest it had touched was $24. It currently stood above $33, so yes, I had a small profit. The tree had gradually lost its branches and fallen throughout the year from its highs, but I had not yet learned how to plant the acorn to my best advantage, and worried that the new tree might never have take root [He was a cane investor through and through — Vic]. The rest of the crowd were besieging the manager, the order clerk and the the office partner with such questions as "what have I got left? ", "can't you give me a report on my sales? ", and "can't you carry me overnight?" The market was rallying by then, to be sure it was rallying, but the recovery came too late to save most of them. I heard the manager explain to one unfortunate: "I'm sorry. but there was nothing else for us to do, we put the stop orders in at about three points above where your margin was exhausted. It was impossible to know in advance that there would be breaks of twenty and thirty points between sales." At such times, we brokers stand in the gap, and all for a commission of just one eighth [a beautiful touch — Vic]. We did our best. The specialist in panics did become a millionaire, and perhaps this will provide some descriptive perspective from one hundred years ago or more. Counting the kind of action, it has been over 1000 days since there has been a 30-minute bar larger than today's 12-point handle at 10 am. One hypothesis is that in trading with leverage, the intellectual nut is insignificant compared to the emotional one. The pain game. Further, pain tolerance related to endurance exercise seems wholly irrelevant. Yes it hurts to pound up hills, but (notwithstanding cardiac arrest) your family isn't going to go begging from that burn. No, it is more like locating supremacy in killing animals not planned for food. Or at least learning to look beyond weepy eyes in their last moments, with mixed feelings of victory and remote sympathy for another sovereign equal about to go down to make you up. Finally, as an exercise in Darwinistic soul-hardening, this year it was time to do something about the army of squirrels eating all the apricots off the tree in the yard. No, we don't need the extra calories or fiber, and yes there may have been "squirrelets" to feed. "Rodents carry disease (e.g., Yersinia pestis)!" 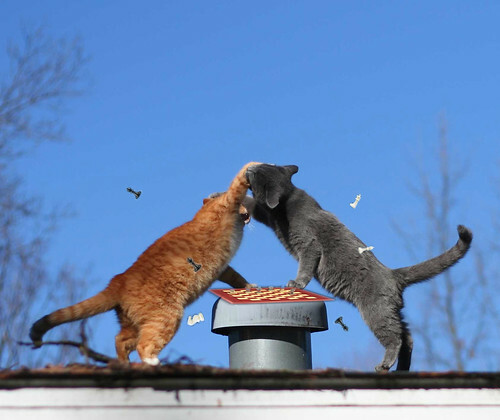 But is it logical to pine for yard rodents while dining on chicken or fish? They must go. The local sporting goods store had on sale Crossman break-back pneumatic 0.177 pellet guns 1000 feet-per-second. A few weeks practice and adjusting the sight made cans at 100 feet easy hits. The first person was the fattest; a bold fellow who bent the branches while hogging the fruit. They hide by hugging a tree-trunk 180 degrees opposite you, and sitting stock-still while peering around the corner. After spotting his plump head, I took a bead, slow breath, and squeezed the trigger. He flew down to the ground at the base of the tree. The Mourners' Kaddish is said as part of the mourning rituals in Judaism in all prayer services as well as at funerals and memorials. Mention of "saying Kaddish" unambiguously denotes the rituals of mourning. The opening words of this prayer are inspired by Ezekiel 38:23, a vision of God becoming great in the eyes of all the nations. The central line of the Kaddish in Jewish tradition is the congregation's response "May His great name be blessed forever and to all eternity", a public declaration of God's greatness and eternality. How grand it is becoming greater than the smallest of the small. A few years ago we had a nice discussion about bridges, their engineering and structure, and how this might relate to market models. Looking at the recent market structure reminded my of the Brooklyn Bridge with a three-day suspension in the middle and two nice towers on either side, a common structure both in rhythm, elevation, and construction. A nice symmetry. The idea is that the market exerts similar forces and results in comparable structures. Yesterday, Beethoven's Fifth Symphony was in the air. Da da da, dum. Seems like a fairly common market rhythm, and in fact it is. A Look At U.S. Home Price Performance in 20 Markets charts the historical year-over-year monthly percent change in the actual home-price figures for the 20 cities that S&P/Case Shiller tracks. The key phrase is "severity of the declines in home price appreciation" — not "declines in home prices." By that logic, if home prices are unchanged year-to-year, it's a "severe decline." Reminds me of Washington budgeting — all discussions of "cutting" the federal budget revolve around declining second, third, and fourth derivatives of dollars/time, not reducing the actual dollars. Yes, in fact, there's a tutorial being conducted by the press on how to selectively report and present data to drive down economic confidence. So far polling data indicate it's working. Most markets are now showing negative price appreciation. No matter how you count it that is a price reduction even before adjusting for inflation. 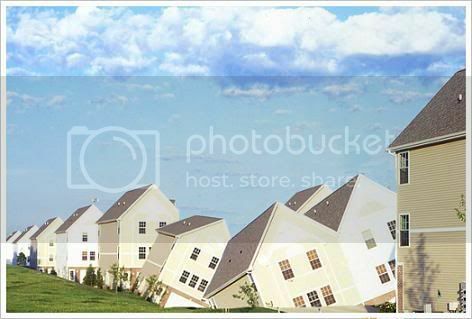 Bottom line is that in both nominal and real terms home prices are falling, late pays/defaults/foreclosures are rising, underwriting guidelines are tightening, and availability of credit as a result is decreasing. All indicators are that pro-cyclical real estate and credit contraction is accelerating. The question is whether or not it has reached a stage of self-reinforcing, i.e., tipped over the fulcrum. To date the trend has been slow, steady, and transparent, much more so than I was counting on at this point. However, the events unfolding in the subprime space today may very well be the precursors to and immediate catalyst for MBS ratings downgrades to sub investment grade. There has been enormous pressure placed on the ratings agencies to act more concurrent with market conditions. It is debatable as to whether or not that is their function but Allied Capital, a large buyer of the lowest grade subprime tranches, liquidated their portfolio in such months before that market began its sudden consolidation earlier this year. A good argument has been made that the rating agencies should have seen what was coming regardless of what the capital markets were doing. With the movements today, those rating agencies now have their own potential legal liability issues to contend with should they not act soon. Vic's NYC Junto is a monthly meeting which focuses on libertarianism, Objectivism and investing. It was inspired by the Junto hosted by Benjamin Franklin in Philadelphia, from 1727 to 1757, and like Franklin, we bring together intelligent people to discuss intellectual issues in a respectful manner. Our meetings are usually held in Manhattan on the first Thursday of each month, and we usually have a guest speaker who can bring new insights and ideas to us. Debate and questions are encouraged, admission is free, and no donation is requested. There is no connection with any political or religious organization or group. Our next Speaker is Ronald Radosh, on Thursday 5th of July at the General Society Library on 20W. 44th Street, between 5th and 6th Avenue, starting at 7.30 p.m..
More details of this and other up-coming Juntos can be found on our NYC Junto website. I've been watching NYSE advancing issue volume minus declining issue volume, and it seems to lead the S&P futures by a few seconds and is a good barometer of the day. Yesterday it rolled into negative territory as the S&P fell off its midday highs before flip-flopping around and rebounding into positive on the up close. Last week saw some days over a million on either side on the runs. It seems more direct than TRIN, the predictive value of which Vic and Laurel have disproved in published studies. In today's mail I received a newly printed checker primer geared to the younger generation of checker player. This fine little book was authored by John P. Cardie and illustrations expertly done by Robert Murr. Both men are from Colorado and have grandchildren who play checkers. My copy was a gift from Mr. Cardie and he is offering signed copies for $14.00 which includes s/h and tax. He says to make checks payable to "checkers creates Kings". Proceeds from his book will be donated to the American Checker Federation youth program. You can order one online or toll free at: 1-877-843-1007. It is the goal of the author to have as many young children as possible get involved in playing checkers and to learn the beneficial lessons of life it teaches. Although underrated, this granddaddy of all board games, is simple to learn, yet very intense. Checkers helps children to cultivate critical thinking skills. My hope is to spearhead a national 'revival' of checkers. Mr. Cardie has four young grandsons and he will be bringing them to compete in the annual Arthur Niederhoffer Youth Tournament. This year that event will be held in the Plaza Hotel in Las Vegas. I am bringing along my two young grandsons to compete as well. More on the youth event and other checker tournaments can be found on the ACF website. The ACF is 501 (C) 3 non-profit. China began construction of a highway yesterday leading to the northern base camp to Mt. Everest in preparations for the 2008 Olympics. They want to host the Olympic Torch at Everest en route to the five continent torch relay. This smart display of hubris comes at a Chinese stated cost of just under 20 million USD. I wonder, with a cost of constructing the 108 kilometer path for the torch-bearers much less than the cost of constructing the top floors of the world's tallest skyscrapers, are the Chinese not real smart at making a global statement? Irrespective of the stated cost being Chinese and irrespective of the fact that it is a smart statement of intent, isn't hubris all about profound gestures of ambition? I find it difficult to assume that China with a continuous history of conquests and occupation of foreign lands is trying to take Olympian harmony and brotherhood alone to the highest heights. It's a good thing we don't have French reporters chatting with Ben. What about Marie Drucker? She is presenting news every evening — but she is dating a former government member, so no chance for us mere mortals. Consider only movements and reactions of one point or more. After a stock has moved in the desired direction by a point or more, wait for the reaction to that particular movement. After the reaction has terminated, and a second movement has begun one point from the ending of the reaction, buy the stock. Protect each trade with a two point stop order. After the second movement of a point or more has reacted, and the third movement has begun, trade again, providing the second reaction did not reach as low as the first reaction. After two points of profits, move the stop to the purchase price. Rules for entering shorts are symmetrical to those above. The system seems much more fairly tested and defined than anything that I have read in recent Point and Figure books, and there is no mumbo jumbo connected with it, what with the system being a clear incarnation of supply and demand. This makes a most magnificent instantiation for a very skeptical speculator. Of course, that's the good news: that the shorts were almost able to overcome the drift of 0.25% a trade, not counting dividends et. al. was also amazing, along with the fact that such a system actually performed almost as well from 1920-1940, (total of 0.2.% profit per trade on the long side, and just a -0.01% loss on the short side, with 469 trades during that period). From 1920-1940 the trade duration was slightly lower than average, at five days per trade, showing that prices were more variable in that second fifth of the century than they are today. All in all, this is a magnificent confirmation of the value of point and figure methods for predicting the Dow, but, regretfully, during the last ten years … well that's an exercise for the reader. On average, in the last 28 years bonds have begun a short-term rally on the 9th trading day of June (6/13 this year). This is a trade I have taught in seminars and taken for the last 10 years. I don't have a clue as to why this happens — maybe readers have some ideas. Perhaps it's just happenstance. But next year I will take it again just as I have in the past. Using TNX, there were not significant gains in 10yr bonds for the three holds. Note that TNX is yield, so increased bond price would be decreased TNX. I'd suggest not using TNX, especially when there are auctions — it doesn't handle those well in the series. I use TNX only for checking on general levels when using my cellphone browser at school functions. Dr. Zussman's comments on my bond seasonal trade were confusing to many readers, so here are the details: What I tested was buying bond futures on the open of the 9th trading day of June, using a $1,600 stop and exit on the first profitable opening plus two ticks. In the last 21 years there have been 20 winning trades. That's how I've traded it for the last 10 years. 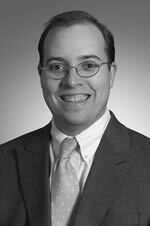 Dr. Zussman tested 10 year cash bonds; I trade 30 year nearby futures — apples and oranges. Hope this clarifies. My boss had an intimate friend who was formerly in the cordage business. I used to hear them talking about how he had sold out his plant for about four times its worth of stock of the National Cordage Co., and how this trust would absorb everyone in the cordage trade, and soon have a monopoly. One day I heard my bosses friend say "when the whole thing is rounded up, that common stock will double in value and pay ten percent a year." This was good enough for me. Here was an insider who knew all about the stock, giving his intimate friend this rare piece of information. That my boss was himself convinced was evidenced by a check which I saw the next day, made payable to a firm of stock brokers and for an amount just equal to the value of 500 shares at the opening price for th National Cordage Co..
All hesitancy on my part now vanished, and at the noon hour I hustled up to my brokers office, sold out every share I owned, and put my last dollar in to Cordage. I was staking everything on this venture, and thought of all the things I would do with the money I was going to make. So carried away was I with the proposition, that I departed from my heretofore inflexible rule, and asked my broker on what margin he would carry the stock. His very conservatism saved me perhaps from what might have been a worse fiasco, as he refused to buy it except for cash. After I bought cordage, it didn't seem to have so much resilience as I hoped, but I thought of the vast negotiations which were going on, and how the value was being added to daily, unknown to the outside public. But there's no use going over the details, everyone knows what happened to me and my cordage. It went from 90 after I bought it, to one, in the panic of '83. It went to pot along with General Electric and a lot of others. To cap the climax, my firm was so crippled by the loss of capital sustained through the senior's investments in Cordage (shades of Imclone), that it was obliged to go into liquidation, and I lost my job … It was at that time that I changed my ways, and I became a specialist in panics. – The Ticker, August 1908. After this loss, the author realized that when they wanted him to buy, and the price was high, they never showed any of the bad points. When they wanted him to sell, they never showed any of the good points. He became a specialist in panics, a cane investor if you will, and became a millionaire in a few years, which he documents in the subsequent two issues of the Ticker. I find that cane investing still works. Indeed, whenever the fake Doctor or his ilk try to bear things down, there is a scare about interest rates or plague or war, and the market reacts: it's time to hobble down to Broad street again. These are great accounts to follow. In the building of my own collection, which I hope to either auction off on the 100th anniversary of the Big Wind (about October 25 - 28, 2029) or perhaps donate to a free market economic research institution (The Von Mises Institute, most likely), I recently scored a great coup. I purchased, from the Dayton Public Library, the entire run of the Magazine of Wall Street from 1920 to 1972. I'm reinforced in my assessment of their great value in your citing of them. "Clearly the weight gain did not come from the exercise variable, but a 'missing' one (missing from the fridge)." The reduction in calories from the fridge was the major variable causing the weight loss but for statistical purposes would there not be more correlation with the exercise variable if the number of calories burned during the time exercised were known? And might the correlations vary at each date in the time series? And how would you account for the physiological changes due to exercise that caused you to become a more efficient calorie burning machine in your off-exercise time? The statistics involved in weight loss in a complex, ever-changing organism seem quite daunting. Here for example is a recent study considering why lower caloric diets don't always have as strong an effect on overweight patients. Pitt raises an interesting point on systems thinking and caloric restriction. It's well known that reducing calories induces your body to lower metabolism, counteracting the efficacy of the caloric restriction. An interesting variant is the observation many years ago that low intensity (aerobic) exercise burns more fat than does high intensity (anaerobic) exercise. Hence the "first order" (i.e., mistaken) conclusion that to lose body fat, high intensity exercise is better than low intensity exercise. However, second order thinking (i.e., looking beyond the obvious) realized that this conclusion ignores, as Pitt points out, what happens the other 23-odd hours of the day and there the advantage goes to high-intensity exercise, which raises the body's metabolism longer throughout the day. And it also ignores, ironically if you think about elusive mother nature, that because low intensity training burns more fat than does high intensity exercise, low-intensity devotees are quite possibly training their body to store fat to be used during future exercise periods! Again: advantage high-intensity exercise. No direct applications to trading, but a reminder of the dangers in failing to look beyond one's immediate area of concern and failing to consider feedback loops. In his book, Beyond Candlesticks, Nison says, "The Japanese emphasize the number three. …[T]he Japanese view a market that has had three rising or falling windows in a row as a market that has reached maturity." Nison refers to a book written in the mid-1700s entitled, The Fountain of Gold - The Three Monkey Record of Money. They refer to the yin and yang, yang being bullish, yin bearish. From the book, "When yang movement reaches an extreme, there is stillness. This stillness gives rise to yin." Nison recommends waiting for confirmation with a bearish movement. The Sept S&P mini futures has had four gap ups in a row and two weeks ago three down gaps in a row. Today's low range market could easily be called stillness. The candlestick patterns have interesting names and history and are a fun source of ideas for testing. Time will soon tell whether these ideas have any merit or predictive properties. In 1979 Doyle Brunson released the bible of all poker books: Super System. It is a 624-page compendium of useful information, notably instructional on hold-em poker. It also has chapters devoted to different poker games such as 7-card stud, lowball, hi-low, and draw poker. Contributing authors include Bobby Baldwin, Chip Reese, Dave Sklansky, and Mike Caro. Caro also devotes a chapter and he has very interesting insights. Since the recent atomic explosion of no-limit hold-em, many how-to books on poker have surfaced. Books that I would recommend are Harrington on Hold-em , Volumes 1 and 2, and Play Poker Like the Pros, by Phil Hellmuth. Both are instructional and will do much to advance the knowledge of the game. Zen and the Art of Poker, by Larry Phillips, deals with the psychological side of poker and is critical to have in the poker players arsenal of book weaponry. These are five books that if studied, read, and re-read will go far in the development of a sound poker acumen. I do caution the student that this will only serve as a foundation for a sound poker mind. The next step is to log in very important hours at the poker table. Live poker is preferred as poor habits can be developed by playing online. And live poker is the only way to learn how to read opponents and develop a "feel for the game." The great T.J. Cloutier said that every time he sits down at a table he tries to learn something about the game or the people he is playing. It is interesting to note that after releasing Super System, Doyle Brunson had to alter his game strategy as many who read his book began to use Doyle's own methods against him. Just as with all other games, the pursuit of poker is a never ending one. Mike Sexton who has played professional poker for more than 25 years commented that he became a much better tournament player after watching the top players and commenting for the World Poker Tour. Poker can be a great game, a rewarding game financially and emotionally and it also can become a nightmare. It offers many paths and a student will be well served to be a lifetime practitioner of the game if they expect to extract the maximum positive aspects of poker. What gets me about all those poker players is how much better they could do trading on a bigger market than nine people's buy-in at a table at the Bellagio. I agree that "Super System" is a true poker bible. Can't say the same for Hellmuth's book, though. It’s kind of like how he was on TV, pretty high ratio of drama/braggadocio to substance, but that's just my two cents. One sort-of poker book I'd recommend is The Professor, the Banker, and the Suicide King: Inside the Richest Poker Game of All Time. It's about a Texas banker who took up no-limit hold'em at around 40, became utterly devoted to it, and challenged individual poker stars to multimillion-dollar heads up games and started blowing them up, because the stakes were so unbalancing to the hold'em stars (who were not nearly as rich as he was). That's how it starts, anyway. Readers should realize that at best these books will only help you lose money at a slower rate when playing against professionals. The game is constantly changing because the players and their strategies are constantly changing. Sound familiar? I read both Brunson's and Helmuth's books recently and I agree that Helmuth's writing is very shallow. His only theme is to play tourneys super-tight at the beginning and change gears as you go. Nothing about the game philosophy. Brunson is a delight and the Caro, Baldwin, and Sklansky chapters provide you with nuggets of knowledge about poker and betting in general. I also recommend Sklansky's "The Theory of Poker," which explains very clearly the nuts and bolts for beginners such as I. The meal of a lifetime is the opening paragraph where Brunson says, "I made millions playing poker and I lost them at sport betting." This speaks volumes about staying within one's circle of competence when dealing in probabilistic fields, where every niche is so competitive that a legend like him gets wiped out when he steps outside. A shocking 43% of deaths in working-age Russian men result from drinking alcohol not meant for human consumption, such as cologne and cleaning agents, according to a new study. This morning I described Russia to my son as the Brooklyn of Europe: lots of smart people come from there, but it's not a good place to stay. I recently spent some time in Ukraine trying to figure out the best way to help them build ethanol plants. 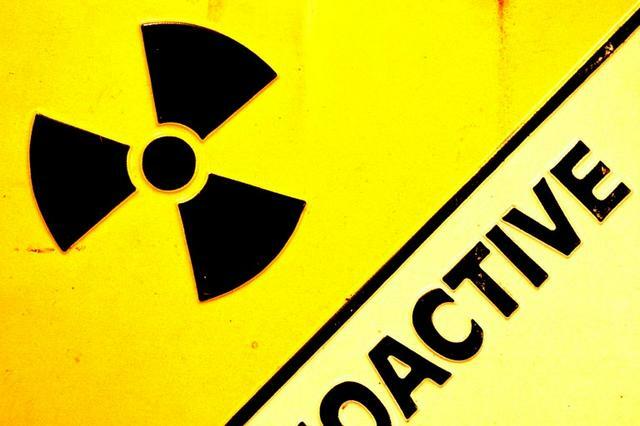 A major roadblock was the fact that the output of the plant is a 'potent potable' and our hosts were concerned that people would try to drink it. I shrugged off the concern because, while 100% grain alcohol is not tasty, it can be consumed, but after denaturing with gasoline, it is nondrinkable. I am aware of just one instance among all 199 of the US plants where an alcoholic employee was caught drinking the final product, and therefore thought this wouldn't be a concern. Perhaps I needed to better understand the locals to gauge this risk. 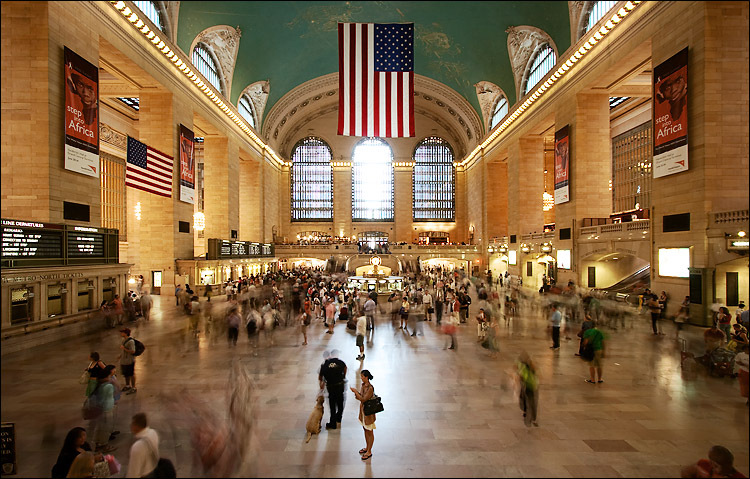 Lovers of New York City or movies have until this Fri., June 22 to see the multimedia exhibit in Grand Central Terminal. It's based on the book, "Celluloid Skyline: New York and the Movies," by James Sanders. But the book can't compete with experience of standing in Vanderbilt Hall in front of a gigantic painting of the stairway in the Penn Station, which was torn down decades ago. There are interiors and landscapes used in MGM films such as "North by Northwest" and "The Clock", plus film segments and stills of NYC streets and skylines in movies from the 1910s to the present. The display has stills from films such as "The Fountainhead" and location photos used as inspiration for the recreations of NYC in Hollywood. The hundreds of photos and paintings have descriptions making their functions clear. An example of this is quote from by the art director Eugene Lourie: "We didn't want to eliminate reality, [but] to create the most suitable reality for the film. By omitting certain useless details, by underlining others…the designer could make the sets more expressive than real locations… A poetic reality, a reality with a soul." The show is open from 10am to 7pm, 7 days a week. This Friday, June 22 is the last day. Recent moves looked a bit like the year 2000 when there were bigger moves up and down. Looking at the average weekly average of the daily range of S&P futures as a measure, and using the median as a robust way to count varying periods, it looks like that measure of volatility is rising recently. During 2000, the median S&P median weekly range exceeded 15 also. This size of larger range was more common in 2000 and during the two years after. There are many great blessings in my life that have made me the man I am today. One of the greatest is the example that my father gave to me of how to be a man, a husband and a father. My dad have had our ups and downs, but never has he ever broken from the example of manhood that he taught me. Let me share with you some of the greatest things he did. First, he showed me through his example how a husband shows respect and loves his wife. My dad was 19 when he found out that his fiancée was pregnant. There are many things that a 19-year-old can do in that situation. But he choose to stand by my mother. They were genuinely in love (and anyway, as I've jokingly told my dad, "where else would a goofy looking guy like you go to find a hotty like mom!"). He dropped out of school and began his life as a family man, providing for us in the best way that he could and treating my mother with the love and respect that she deserved. Then in 1979 my mother, merely 34 years old, was diagnosed with Multiple Sclerosis. The prognosis from the doctors was bleak. Early onset MS (in 1979) did not afford much of a life expectancy and certainly meant a bleak future for my mother. Mom, realizing that dad was still a young man with a full life ahead of him, did not want him to have to suffer with all that was going to happen to her. She told my dad that she wanted a divorce so that he could have a full life with a wife that wasn't going to have body that was falling apart. My father, knowing the bleak future that lay ahead, stood by my mother. Regardless of what lay ahead, he was in love with my mother. Furthermore, he had a made a promise to her. Part of that promise was, "in sickness or in health, till death do us part." My father taught me the importance of honor and integrity not just with his words, but with his actions. I didn't learn about that story until years later. But I recount it here with great pride. My father is a man of honor! But being honorable is easy when things are easy. What did my father do when things got rough (and man oh man, did they ever get rough)? Mom went down hill quickly, but dad stood by her side and she fought back until the MS went into remission. Then, with the encouragement of the love of her life, she decided to use this adversity and turn it into an opportunity. She went to college. She graduated with her associates degree with straight A's. My father encouraged her to study and not worry about things as he took care of earning the money and did a lot of the housework. She then earned her bachelors degree with straight A's, save one B in Algebra. All the while dad took care of his work and much of hers plus having to care for her extra needs. She then went on to get her masters degree, and she didn't just get any masters degree. She got accepted into one of the most prestigious universities in world, Washington University in St. Louis. She graduated with straight A's! Sure, mom did the work, but I credit my father with her degree, too (as did mom). She needed someone who would love her and encourage her and help her and take care of her extra needs. My father stood by her side and loved her, encouraged her and did whatever he could to help her along the way. Sure, there were problems and difficulties along the way and an argument or two here and there. But what an example my father set for me. After she graduated, mom went to work and dad had to drive her everywhere she wanted to go as she had mostly lost her ability to drive safely. Then one day it happened. Mom slipped and fell at work. This was the catalyst that brought the MS fully out of remission. The ravaging of her body began. Everything they feared would happen to her 19 years earlier began to happen with a vengeance. Her body began to shut down. She lost her ability to walk. So dad pushed her around in a wheel chair. Then she lost her ability to dress and put on make up. So dad dressed her and put on her make up. Then she lost her ability to even get out of bed. So dad got her up and put her down whenever she needed, and on top of that, he took her almost everywhere he went. Then she lost her ability to control bodily functions. But still, dad took care of her. He cleaned and bathed her. He washed her hair and did his best to comb it and style it and then put on her make up. Then she lost he ability to swallow. So dad fed her through a tube. But that was the easy part. You see, since she couldn't swallow, she would choke on her saliva. Dad would have to suction out her mouth several times an hour to prevent her from choking, which she did quit often. But that still wasn't the hardest part. Mom couldn't swallow. So she would wake up choking every 30 - 45 minutes. Dad would wake up and suction out her mouth, reposition her so she wouldn't get bed sores, and then go back to sleep until mom woke him choking again 30 minutes or so later. My father would not put my mother in a nursing home. No one was going to give the love of his life the care that he could and would give. Even as his health faded he took care of mom. There were times that he looked like a walking zombie, but still, he persevered. And he did this for 5 years! He taught me through his actions never to give up, to honor your word, and to do the right thing, not just when it was easy, but when it was the hardest! That is the true sign of a man! But that was the hardest thing he ever did. On May 5th, 2004, in the morning, he called me on my cell. I was out of town. He told me that I needed to get home, that mom wasn't well. He told me that he was wanting to bring in hospice to help with mom and that he wanted me and my brother to be in on the decision. Basically, by bringing in hospice they would help, but that also meant that we had to sign a Do Not Resuscitate form. By this time mom was not only a complete physical vegetable, but her mind was 95% gone too. I cancelled my remaining appointments for the day and came home. My dad, brother, and I were meeting with the hospice nurse as she was doing an exam on mom. We could all see that mom was in really bad shape. We asked the nurse what did she think, and she told us that hospice really wouldn't be necessary as mom was likely going to die within a few hours. She told us to call anyone that we needed to call. We got on the phone and called my grandmother (mom's mom), her brothers and sisters, my dad's sisters and some other close family. Everyone who was in town came to the house. We all stood around the bed with her. My dad sitting at her side, stroking her face, the grandkids on the bed sitting next to her, holding her hand, stroking her face, or with their hands on her legs. Her mom sat at the foot of the bed rubbing mom's feet. This sight overwhelmed me as I stood there watching. My mother was surrounded by love, the women who gave birth to her trying to warm and massage her feet, her loving grandkids at her side as well as her two sons. As she lay there she began to struggle to breathe, her breath became gasps, but still she held on. Then my dad, who had given me example after example of how a man, a father and a husband acts, gave me the greatest lesson ever. He leaned into my mom's ear, holding back the tears and gasps. He said, "It's OK, Sharon. You can let it go now. Just wait for me and I'll be with you soon. It's OK to go, I love you, it's OK to let go!" Then my daughter leaned in and said the same thing, as did others in the room, including her mom. And then, like you think you'd see in a movie, my mom just seemed to relax. She stopped gasping and her breathing slowed and got shallower. My dad leaned down and said something in her ear. And then she just stopped breathing. As much as my dad loved my mother, she loved him back just as much! She wanted to live passionately, but she knew that she was at the end of what her body could take and was living strictly on the power of her indomitable will. Still, because of that, she suffered immensely. I believe that my father released her with his words and gave her permission to let the pain stop, even though that meant losing the love of his life and his entire existence for years. So why am I telling you all this story of my mom on Fathers Day? This story really isn't about my mom. This story is subtitled, "The greatest work you will ever do is within the walls of your own home". You see, I could tell you all about how my dad coached us in little league to championship after championship and the life lessons he taught me by coaching me, or the lessons he taught me by working any and all jobs to support his family when he was laid off from work, or how I was never hungry or cold, or how I had a largely worry-free childhood. I could tell you about the lessons he instilled in me by taking me fishing and hunting, or how he sent me to private school that he really couldn't afford to get me out of the public system that we were otherwise stuck in. I could also tell you about how this story has a happy ending. You see, my mom always insisted that when she died that she wanted dad to get remarried to a wonderful women who could give him everything that she couldn't and to enjoy the rest of his life with. Dad found that women when he married Patty. I jokingly tell my dad that he's won the wife lottery twice in his life! He's found two great women that love him dearly and treat him wonderfully! Sure, there are all kinds of good lessons with many market analogies that I could tie in. But what I want to drive home is this simple lesson: Do unto others as you would have them do unto you. Or, if you want a more secular version: What goes around comes around! My father taught me through his actions how to be a man, how to be a father and how to be a husband. He may not be a bigwig to the rest of the world; he may not have achieved great financial success, and he is certainly not "world renowned" at anything. I pray that I may be the man my father never was so that my children can be the man I will never be! Thank you Dad, for giving me that foundation to build on! Thanks for all you've done. Thanks for all you do! You're a great man! I am honored to be your son! "Duuude, you really missed it!" said the surfer on the shore as I came up and asked him how the waves have been. "Ya should have been here yesterday. It was 6 feet, glassy and perfect." It's a classic scenario played over and over. You have to go in and surf the lousy, windy, junky days when the surf is bad in order to get the really good days. You can't just pick the good days or you won't be in good enough shape when the waves hit, and due to the random ever-changing cycles and sudden runs, unless you are there "on it" in the water, you're going to miss the epic sessions. How many days have I been out in lousy conditions by myself when the winds turn around, the swell hits, the tide turns and I am out in perfect conditions with no one out? In Reminiscences of a Stock Operator, Lefevre recounted the story of Mr. Partidge, "The Old Turkey," an older operator who refused to sell out his position on rises. Lefevre wrote, "Everybody knew that the way to do that was to take profits and buy back your stocks on reactions. And that is precisely what I did, or rather what I tried to do; for I often took profits and waited for a reaction that never came. And I saw my stock go kiting up ten points more and I sat there with my four-point profit safe in my conservative pocket. They say you never grow poor taking profits. No, you don't. But neither do you grow rich taking a four-point profit in a bull market. Where I should have made twenty thousand dollars I made two thousand." Wise old Mr. Partridge said, "I couldn't think of selling that stock. Why this is a bull market!" And he said it as though he had given a long and detailed explanation. "My dear boy, if I sold that stock now I'd lose my position and then where would I be?" Not much chance to get back in last week's rise except for the young and the brave. I notice that on Friday June 15th the futures ended at approximately where they were on Friday June 1st, or Tuesday June 5th. Also, there were three big down days in a row during the week ending June 8th, and three big up days in the week ending June 15th. Many other regularities appeared in the last two weeks, and generalizing them to all weeks of the year could be a meal for a lifetime, or at least for a day. To help me in this pursuit, I have been reading the chapter on code construction in the book Strange Curves, Counting Rabbits, and other Mathematical Explorations by Keith Ball. In particular, I am very interested in the idea that the ideal curve should have various codewords that are as different as possible, so that it is unlikely that their content will be mixed up. This is very closely related to the astonishing results in Kendall's Rank Correlations work — that the number of interchanges necessary to bring one set of ranks into another is the same as the number of inversions in their perspective rankings. I believe that there are many helpful ways of extending these two ideas and perhaps some of them will give some insight into what is going to happen in the future, including next week. I noticed a society much at peace with itself managing nearly one fourth of the world’s wealth while traversing across Geneva for three days. Not a single war in the last five hundred and fifty years. Yet despite continued prosperity they have not built even one skyscraper! The chairman’s hubris indicator has another corroboration from this metropolis. Yes, the only real tall structure out there is a giant fountain in the middle of a huge and clean lake that overshadows all other low-hung medieval looking architecture. Here is a society that has clearly known that there is no money in ego. For a first-timer like me in a new city deciphering the map to the last building is not always easy. At each occasion that I had to request help seeking directions to any particular addresses I was shocked positively that they were willing to take a small walk ranging from 50 to 250 yards showing where I needed to go. In all other cities that I have been the best help I have received ranged from a helpless smile to a quick pointing of the finger. Hoi polloi of Geneva are happy, positive, and willing to spare time for a total stranger. The city has a very proactive pro-business administration. Each tourist or foreign national arriving into Geneva is given a free pass by their hotels, paid for by the city administration, that entitles the recipients to travel freely in Geneva using all public transport. No rushed trains, no filled up trams, buses stopping by to let pedestrians pass (not just private vehicles but big buses stopping! ), near zero pollution, hoards of art-dealers, bankers, jewelers, confectioners, members of the oldest profession, politicians, bureaucrats, aspiring summer interns — you could see them all passing by in a single day, at peace with their diverse objectives conjoint only at wealth and power in this one city. A visit to the United Nations reminded me of the many key pacts, conventions, and treaties signed at and containing the name of Geneva. I had a negative experience too. On the first day of my arrival I went to the McDonald’s on the Rue de Laussane knowing that it is one hygienic food parlor that will have some fare for a vegetarian too. I found it but had my wallet picked up. Within three hours of landing in a new city, to be left with a situation where all your credit cards and cash are gone can be a shock. However, the manager of this McDonald’s took me to his cubicle and surprised me with a replay of the tapes of at least four different hidden cameras installed in the store. In less than 10 minutes we were zooming on the face of the individual who picked up my wallet. The famous Corps de Police of the Republique et Canton de Geneve were called in. They took 20 minutes to arrive and promised to collect a copy of the recording from the store manager the next day. Then they noted down the physical features of the wallet-picker with a few replays of the tape. The police officers promised me all positive action and left graciously. However, a sixth sense told me to grab the phone, call my banks and cancel all the cards immediately and seek activation of the replacement cards. The last day that I was leaving Geneva I visited the police station and the McDonald’s to check if any action happened. I discovered the police officers had not yet returned to the store to collect the tape and had not yet flashed the physical features of the wallet picker on their wireless vans! I am certain that McDonald’s does not have hidden cameras across their stores in possibly any other country. Bottom line: the big brother in Switzerland is watching everyone. But credit card thieves, small pickpockets, and denizens of this universe without the potential of owning a numbered account yet can fend for themselves. But then a city thriving upon 500 years of warless prosperity gave me a sufficiently happy time to forgive and forget. I am surprised but nevertheless pleased by your impressions of Geneva. Although it's my hometown, it is not particularly known for its friendliness toward visitors. The infrastructure, aesthetic, and the quality of life have declined remarkably over the past 20 years. Geneva had its golden era in the 60s and 70s with oil money, but everything is relative and it's still a wonderful place to live. May I suggest that you also visit Zurich on your next trip? 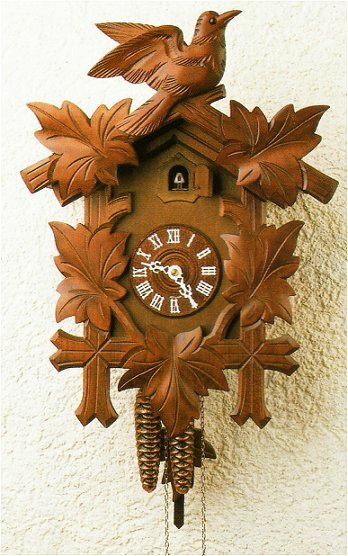 Perhaps you are familiar with the famous quote from Orson Welles in The Third Man, "The violent Italian culture that produced the Borgias also produced Michelangelo, while all the Swiss, known for 500 years of order and good manners, could come up with was the cuckoo clock!" I thought readers might share my interest in the work of Professor Jan Vecer, of Columbia University Statistics Department. Vecer has developed and published a mathematical approach to predicting the winner of professional tennis matches. He has also been working on "Maximum Drawdown," which he defines as the drop from an asset’s high to its low price within a given time frame. A common assumption in finance is that because of panic, declines are bigger or faster than rises. Though through personal experience it certainly feels like it, evaluation of single-day moves does not bear this out. Notice that for the biggest three up and down days, the magnitude (of move and st dev) is bigger for drops. But going down the list, paired ups are bigger than downs. This effect was evaluated further by charting the sum of paired up (positive) st devs and down (negative) st devs. This shows that for all but the most extreme three pairs, the size of big up days is greater than big downs all the way to 40 pairs. Moving in from the tails beyond 40 pairs reverses the size relationship, but the differences are much smaller. So it seems that for daily returns extreme up-days are bigger moves than extreme down. 10 years and look at not 1-day, but all 3-day moves (overlap allowed). In only one instance in the top 20 does the positive move have a greater magnitude than its paired negative. than the positive 498 times. So, watch out for those drops! I have taken Ms. Kenner's advice and just now ordered The Wonderful World of Mathematics for my grandson. Amazon had one original 1955 copy for $10.00. This got me to reminiscing back to 9-14-67 and an old hand typed letter I have in front of me from the late Checker World Champion Tommie Wiswell of Brooklyn, N.Y. In that letter and many others Tommie sent me he gives much sound advice. I just found his earliest letter to me dated 9-8-67 and he thanks me for my order for catlin checker pieces at $3.50 per set and green and buff boards at $3.50 per. Today the ACF through our online store sells pieces at $22.50 and boards for $15.00 per. I still have those early board sets and all the books I bought from Tommie. Amazon is quick, but over the years something has been lost in that personal 'one on one' relationship that I knew dealing with Mr. Wiswell. He wrote, "Thanks for the letter and check, mailed boards and checkers today. Books must be divided into various categories: For reference, for openings, end game study, midgame play, problems, general study." He goes on to say, " These are only a small number of the books I recommend for a complete library. Books are important because knowledge is power in checkers and the more good books you have the more ammunition you can acquire for the battle. You are not supposed to study them all, especially the reference books but to refer to them when you lose. The openings you should study as well as the endgame books. Some are just for enjoyment alone." In 1980 Tommie wrote a deluxe hard bound book with Mr. Jules Leopold of NYC titled: The Wonderful World of Checkers and Draughts. Two world class players explain the game's fundamentals and explore both its simple pleasures and challenging complexities. Original cost on my dust jacket for this book was $10.00 and my copy is personally signed by Mr. Wiswell. This fine book is 175 pages and covers such tactics as the dyke, the bridge, the opposition, and the dog hole. In the discussion on how to win second position, it is actually shown that it is possible to see eighty moves ahead in a game!. In this book the reader learns how to conduct the game at each stage. Meanwhile, as he becomes increasingly aware of the myriad ideas that arise in play, he will begin to appreciate the beauty and depth of this 'simple' game. Mr. Wiswell's advice carries over into the market when he advocates building a large library of reference materials and says, knowledge is power. In checkers or the market you have to know what you are doing and make moves in the right direction or you are doomed. Tommie speaks of knowing where to begin and end in a game. Keeping one's mind alert and sharp will greatly help in many endeavors in business and in life. In the Chair's Education of a Speculator, he devotes one chapter to board games and their usefulness and 'carry over' into the market. One has to learn to think outside of the box and let your mind flow freely and without limits. As a brand new prospective trader I have been studying the markets for two years in preparation. I have read many 'systems' and technical analysis tomes and have been bemused at generally how imprecise they are in their execution. I do like Joe Ross's techniques (he pooh-poohs technical analysis) and I even found a retail FOREX trader who eschews technical trading. I still have to make a decision about what market to enter but I am seriously looking at seasonal spreads as a kind of no-brainer easy start to trading. I read your book Practical Speculation and I loved it! I am a confirmed skeptic and a big fan of Skeptic Magazine. Your insertion of a scientific method into the general flimflam is exactly what is needed in this hugely unscientific arena where unscrupulous sellers of snake oil abound (I also think Atlas Shrugged is a great book). As work on such things (among other distractions) can interfere with trading, one tries to bear the market in mind. In writing the first half of a sonata form movement, one proposes two themes in the tonic key, bridging then to two themes in a contrasting key, usually the dominant or the relative minor. Now the proportion of time spent in tonic compared to the other key is significant. If the tonic section is too short it does not allow enough gravitas before moving to the other key. This is all about emotional response to the establishment of dynamic tension. Is there a parallel in the Market? I am using a phi-mous ratio, with the contrasting section approximately 1.6 times the tonic section. So I would be interested to see if similar ratios are found in the triumphs and otherwise of the S&P 500, and if not to re-evaluate patterns again after some kind of normalization which removes volatility; this latter being akin to the conductor gesturing accelerando or rallentando (in music irrelevant to the number of bars). With my old stock-based calendars gradually being replaced by new spreads based on indices, I'll be giving such ideas more attention in the coming months. I guess it would also be timely to learn something about P&F. I was really surprised to see how much Robert Bacon's book goes for on Amazon now, making my purchase of a copy, way back when, the single best trade I've made in many, many, many years. I'm talking about on paper of course, since I wouldn't dare attempt to book any profits from the trade. I would only sell it after the book price crashes and bottoms, and I desperately need the money just to try and get back to even at Aqueduct, late in December, just before they cancel the remainder of the card due to snow. As Kevin remarks, it's becoming tough to find copies of Bacon at reasonable prices. I believe it's a case of inelastic supply (it's out of print) meeting expanding demand (~100% driven by our readers). A similar case is an obscure technical book from 1974, published by astm.org that I buy whenever a copy turns up on Amazon, Abe, or eBay. Generally, engineering books from the 70s would sell for near-zero, but it's a nice keepsake for me. The Dedication is to my father, who worked on the book and died before it was published. So I'm the entire market for that specific title. I had an enlightening chat with the CEO of a listed real estate company today about their growing opportunities. They target shopping malls owned by non real estate professionals, typically, developers whose core skill is getting the permits and building, but then can't run the mall with maximum efficiency. So, part of his job is going to these guys, who might own one or two malls, and start whispering all sorts of doom predictions and forecasts, which are all more believable because he's the main guy in the sector. Finally, he says, "It's time to sell and take profits." Guess what? He then proceeds to buy from them, increase cap rates and make a nice buck. Mmm…I think I know somebody who does the same thing. Coincidence? Oh, and his stock? He's buying, thank you. I see your colleagues are trying out a new verb this morning –"quicken"
It has a nice Elizabethan feel to it, as if the newswire were running in 1580 — "Horseshoe prices quicken in early London trading." Nothing could have prepared them for…the quickening. Headline composition is the only widely used form of constrained writing I'm aware of. You specifically write to space, not word count, syllables, etc. In the days of hot type you had to remember arcane counts corresponding to the width of each character, both upper and lower case. The mark of a great headwriter was the ability to hit the exact length needed, with something catchy and relevant. Writing headlines on deadline at newspapers trained me to cycle through my mental thesaurus efficiently. This makes composing ordinary prose a relatively easy task. Headline writing as a vocabulary drill for kids? I may try this at home.